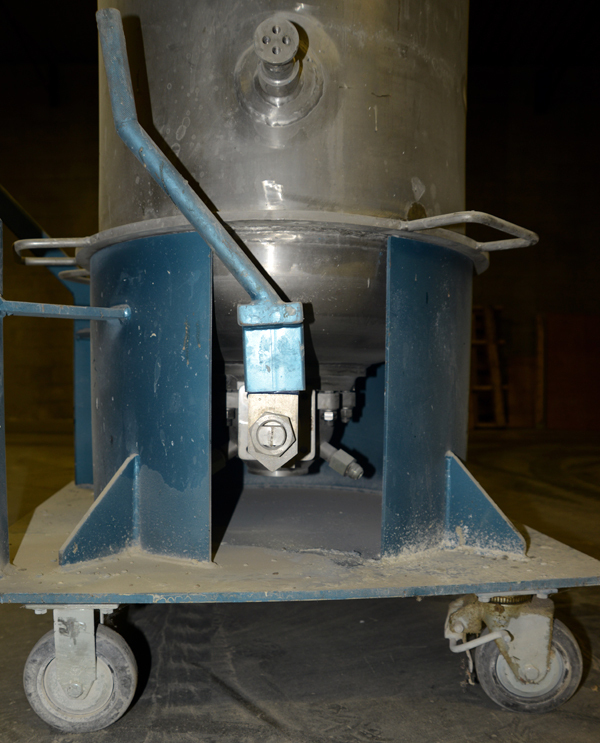 We also deal in used Shaker Mixers like the WEB Turbula and dyna-MIX Container Mixers. 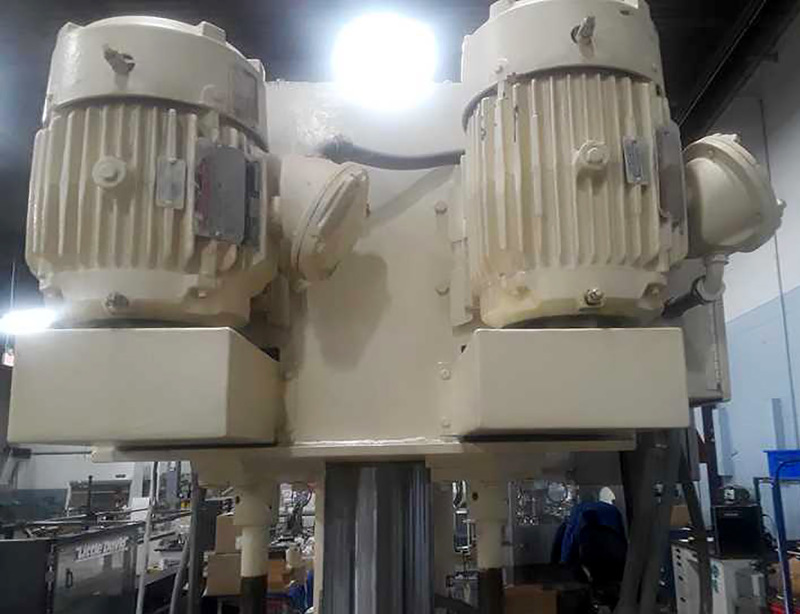 Click here to see used Ross mixers we rebuilt. If it is on the used market we can find it quickly! Click here to subscribe to our email/mail list. 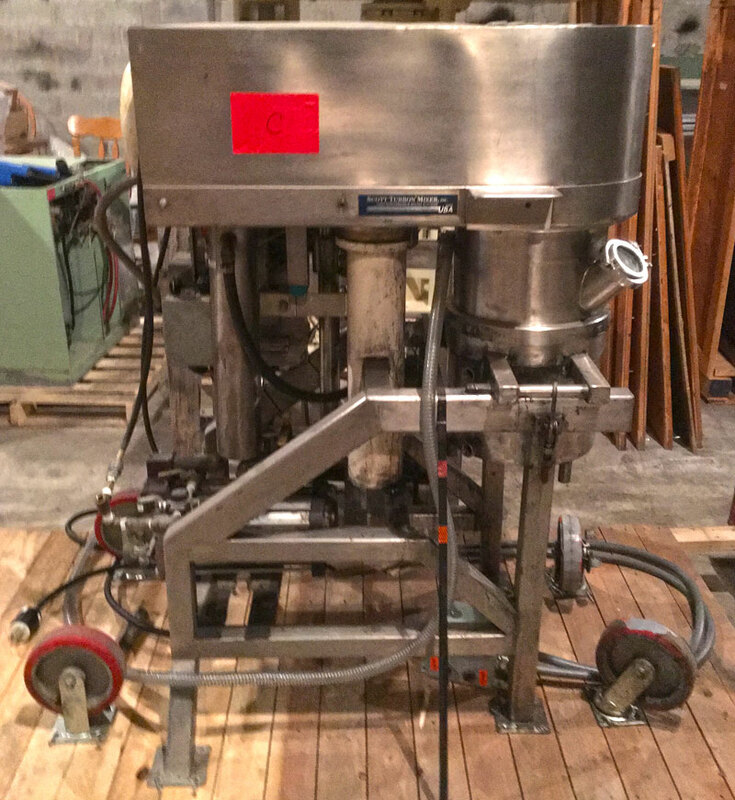 ROSS HDM-225 Gallon Double Planetary Mixer, 1of 3available. When you deal with UsedRossMixers.com you are dealing with a mixer expert. I am Rénald A. 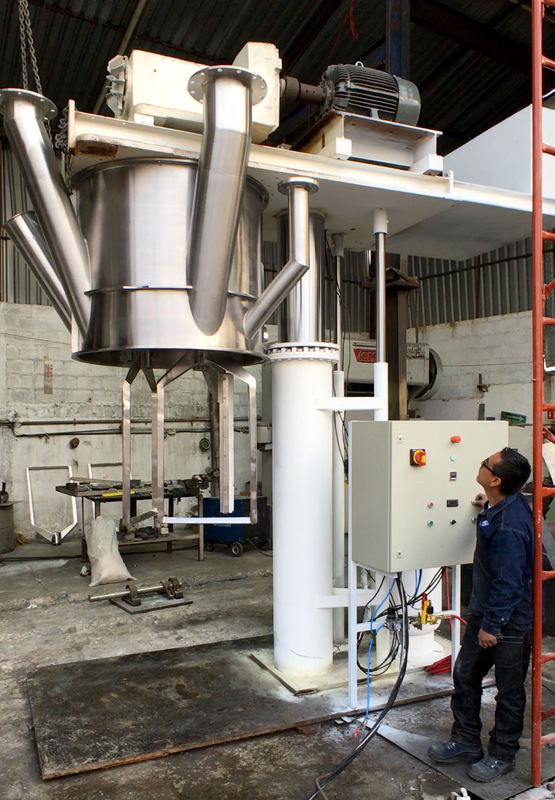 Richer, a professional engineer with two decades of experience in mixing technology and the owner of UsedRossMixers.com and of Archem Process Equipment LTD. 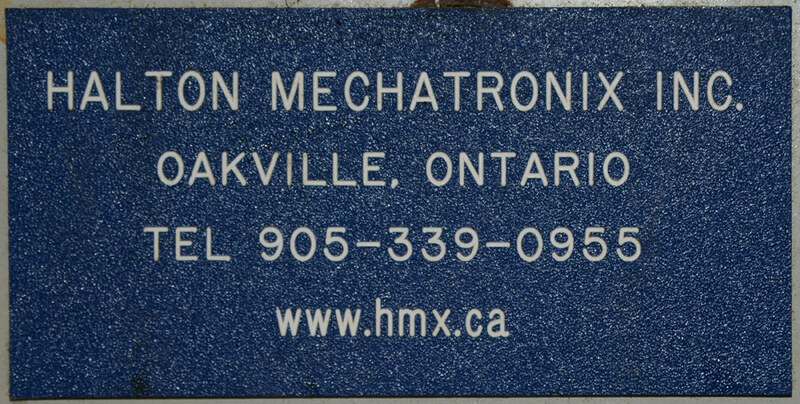 I have worked for Lightnin, represented Chemineer, Kenics, Ross, Ekato, Stelzer and I am the inventor the world's best static mixer. I alo offer new custom made equipment. When you need more than5just hardware, you will see the difference I can make. Click here to download our Newsletter and Stocklist in PDF format. I want to buy your surplus equipment. 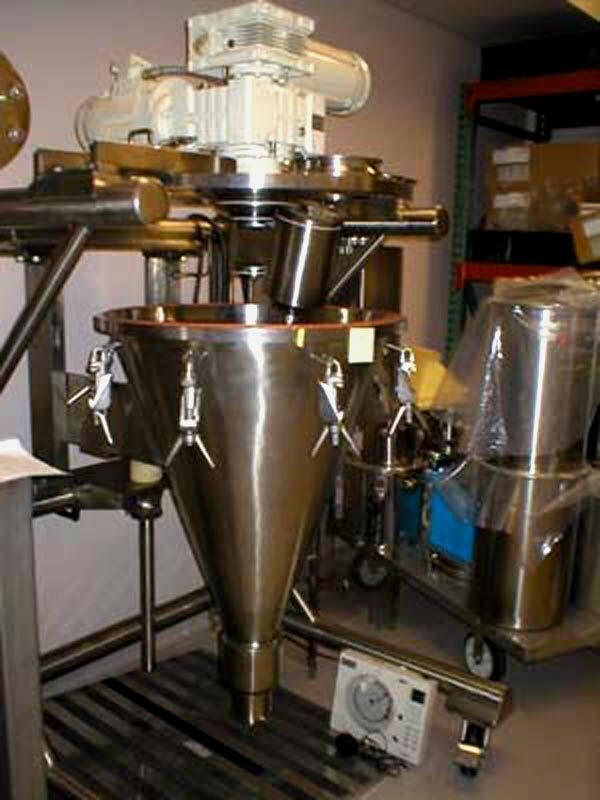 Mixers, blenders, presses, reactors, production & lab equipment. 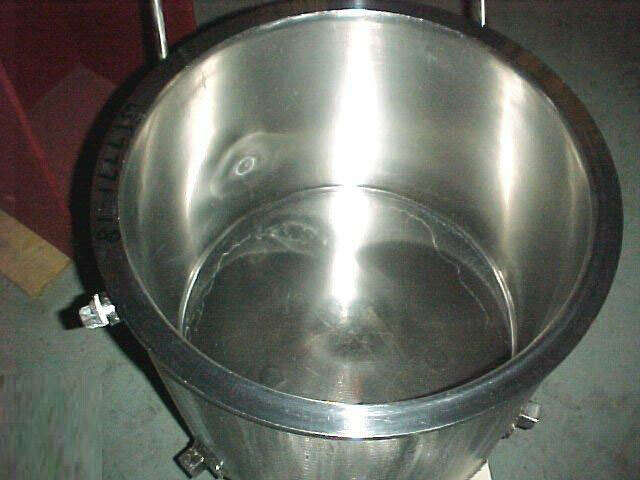 Listed in increasing size order from 1/2 Pint to 600 gallons. Partial listing updated April 22, 2019. We have more to offer not listed here. 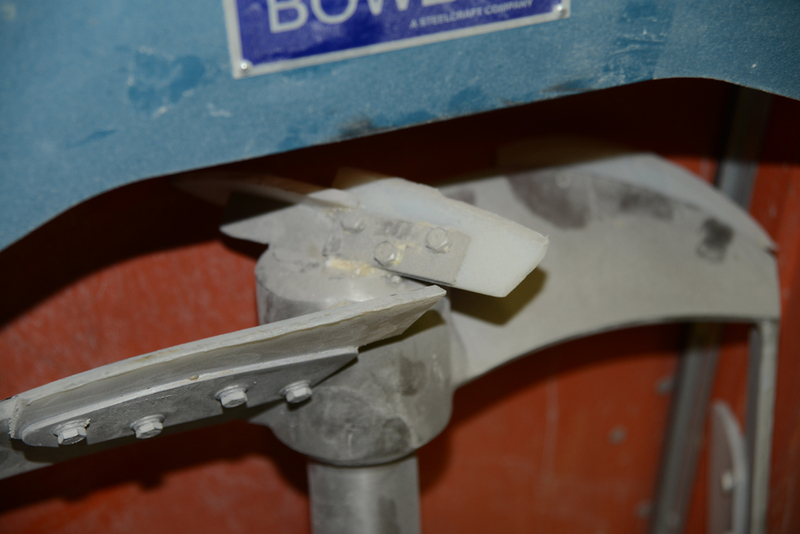 - Comes with a standard rectangular mixing blade and a high-speed disperser shaft, the blade is currently missing. 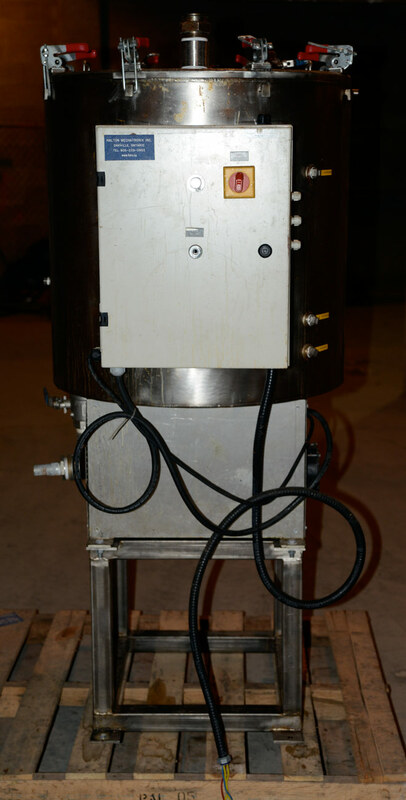 - Vacuum hood, with multiple ports, a vacuum port and gauge as well as a light. 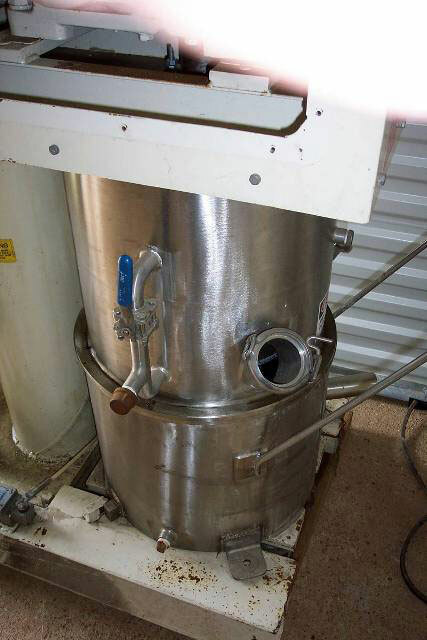 - Comes with one 40-gallon non-jacketed mixing can fitted with an outlet on front tank wall. 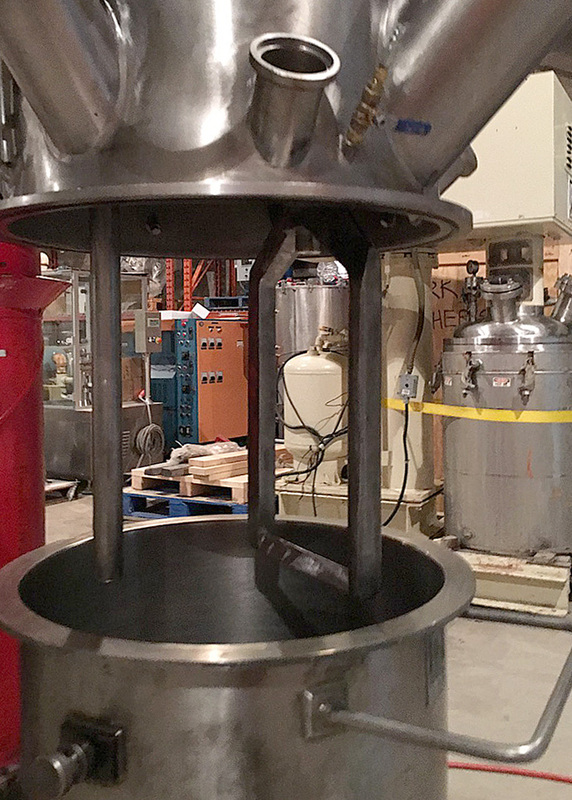 - Prior use was at a chemical products company. 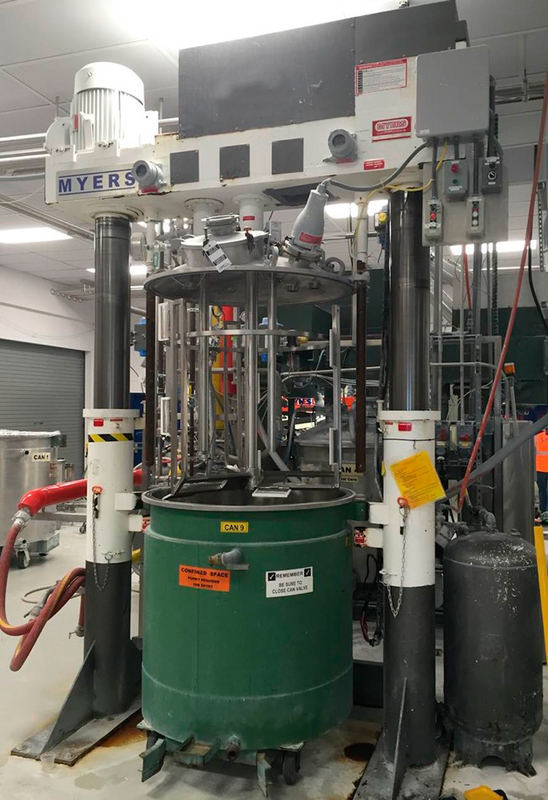 - Mixer has been test run and was reported to be in good operating condition. SOLD, I NEED LARGER ONES. 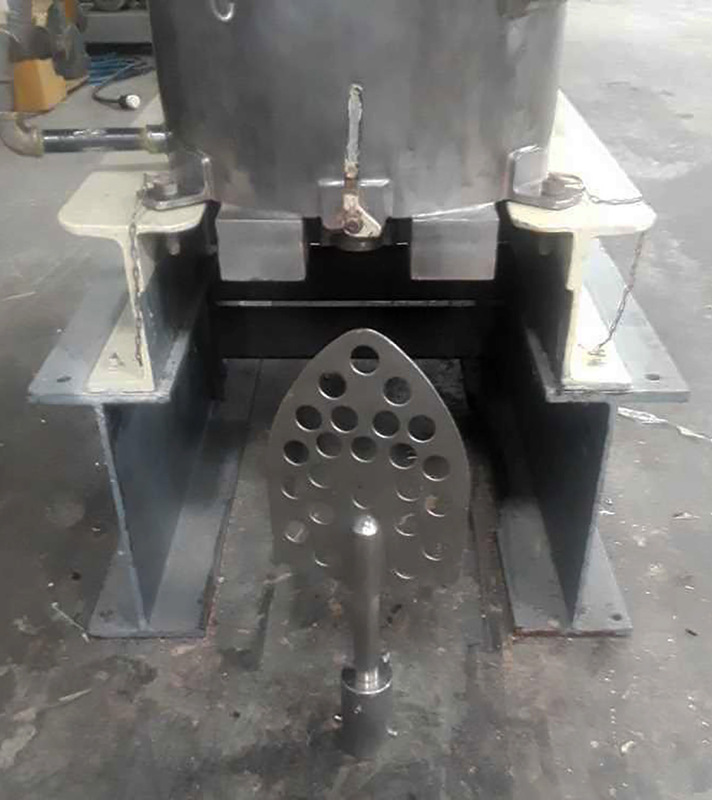 - The anchor agitator has three wings with scrapers along the sides and bottoms. 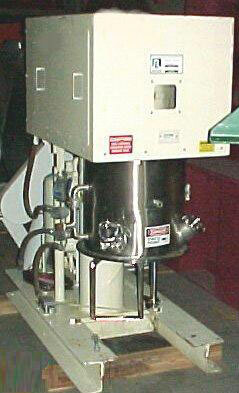 - The high-speed disperser agitator is driven by a 30 HP inverter duty motor with speed control. - The 3-wing anchor agitator, with wipers, is driven by a 20 HP inverter duty motor with speed control. 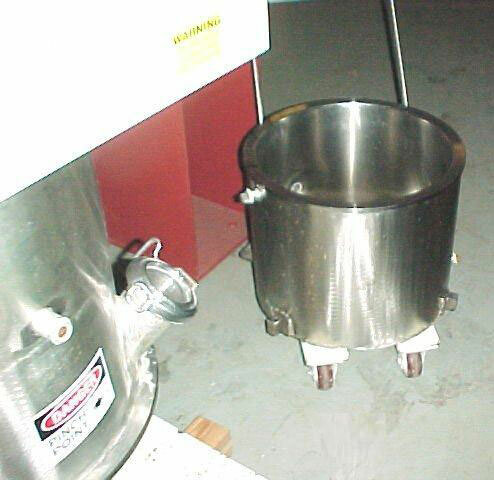 - The mixer originally had a third agitator, but it has been removed. The port is still there if you wanted to add another mixer. - The mixer was new in 2005. 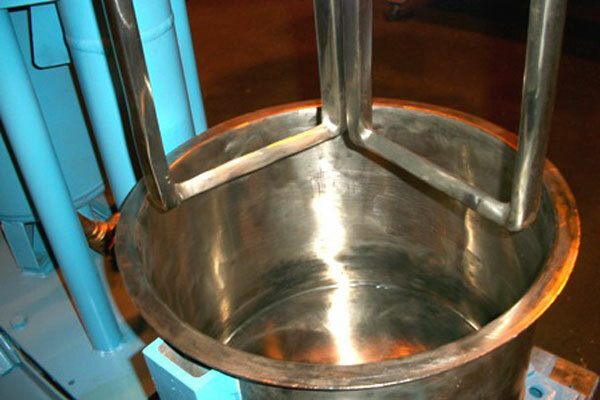 - Product contact area is made from stainless steel. 1, 2, 4, 10, 40 and 200 gallons. 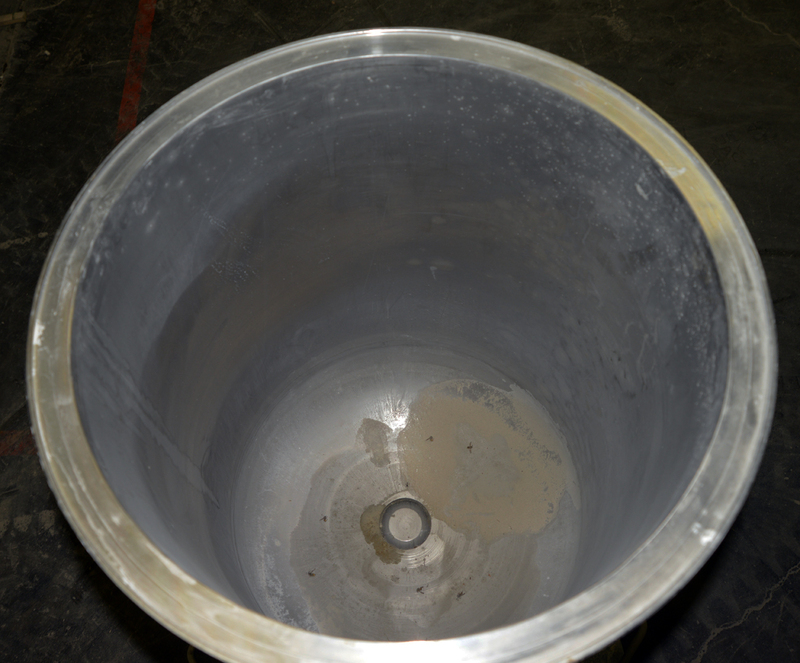 We also have dust shields for 4 and 10 gallon Ross mixers..
Sold and I want buy yours. 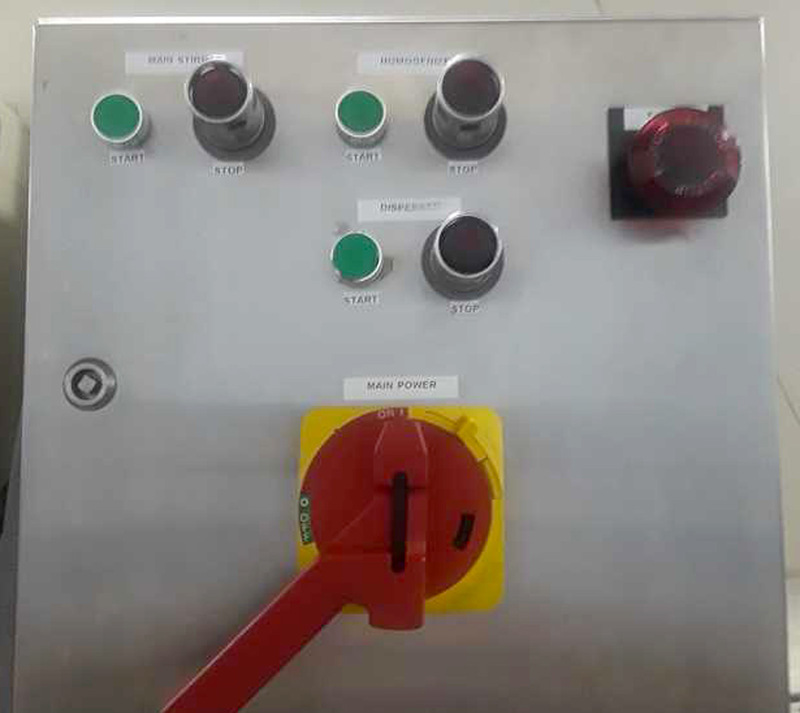 - Designed for operation under vacuum. - Vacuum hood is fitted with 2 sight/charging ports. 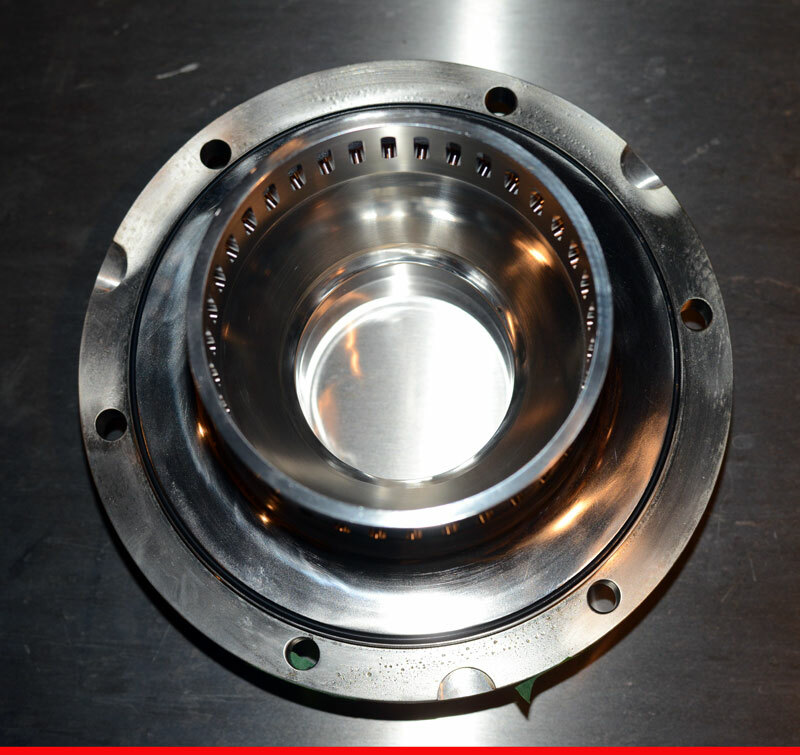 - Contact parts are made of stainless steel. 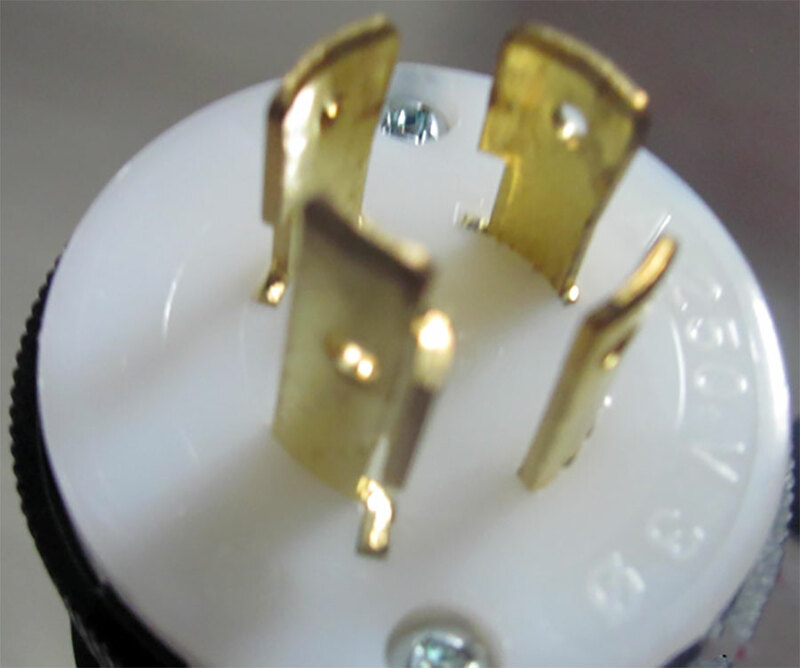 - Fitted with two with HV BLADES, High Viscosity agitator blades. 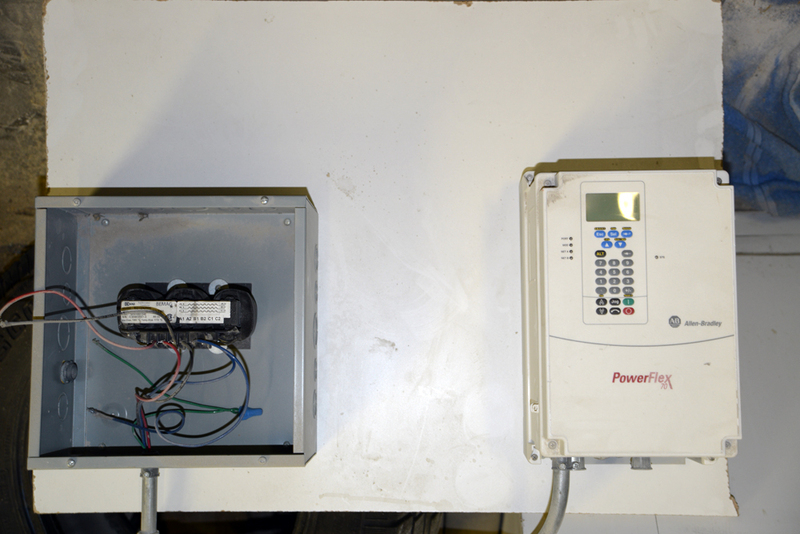 - Agitator is controlled by an Reliance SP500Variable Frequency Drive. 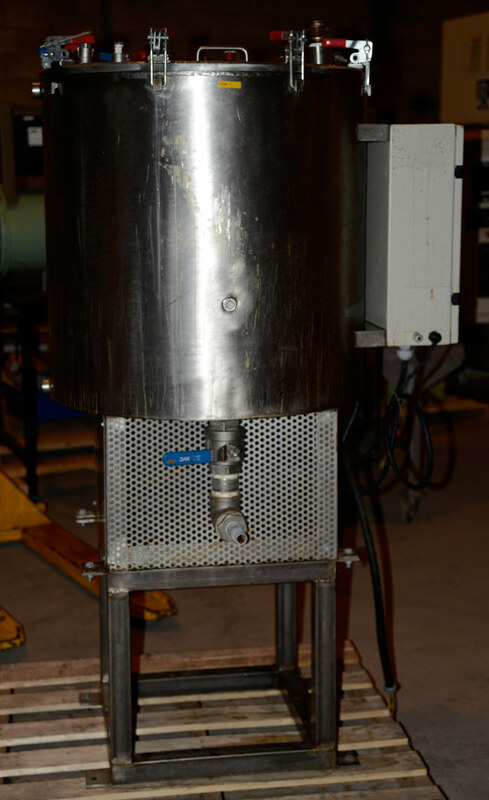 - Tank has one handle to facilitate the installation and removal of the small tank. 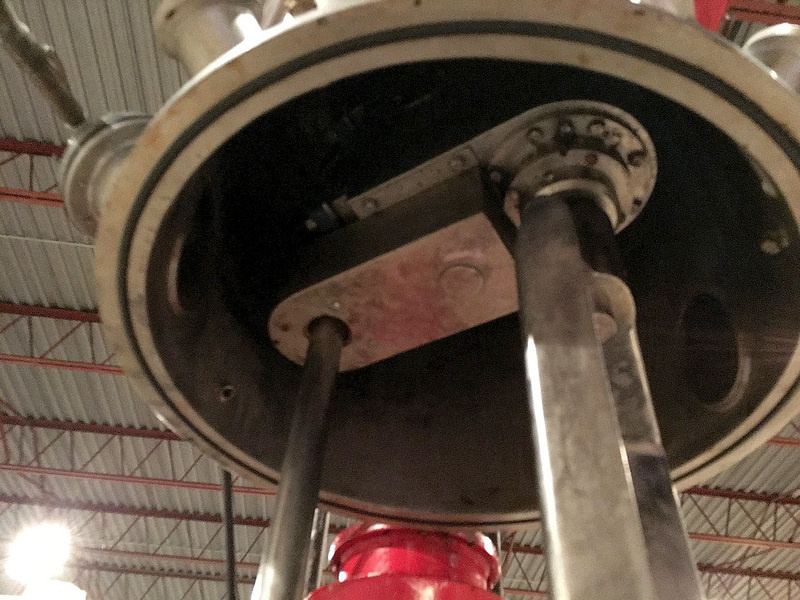 Thank is secured in place by a sefuring device under the tank. - Prior use is with a pharmaceutical company. 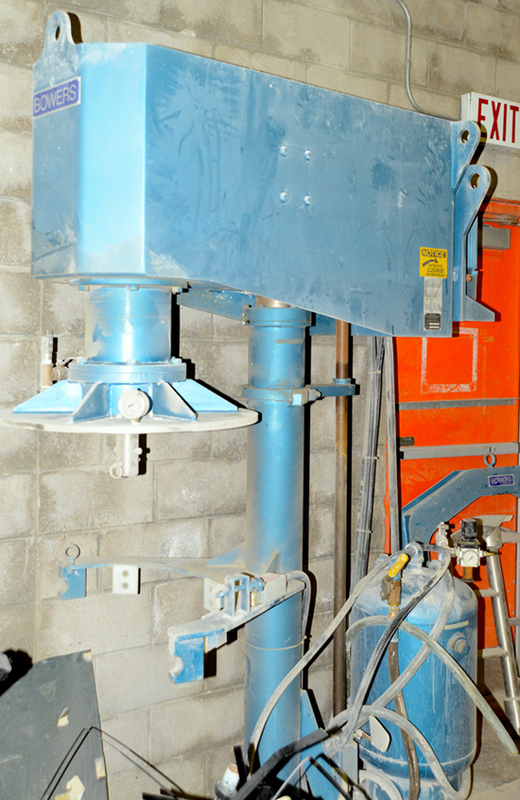 The mixer in the photos has been sold but I have another unit and I will upload the photos soon. 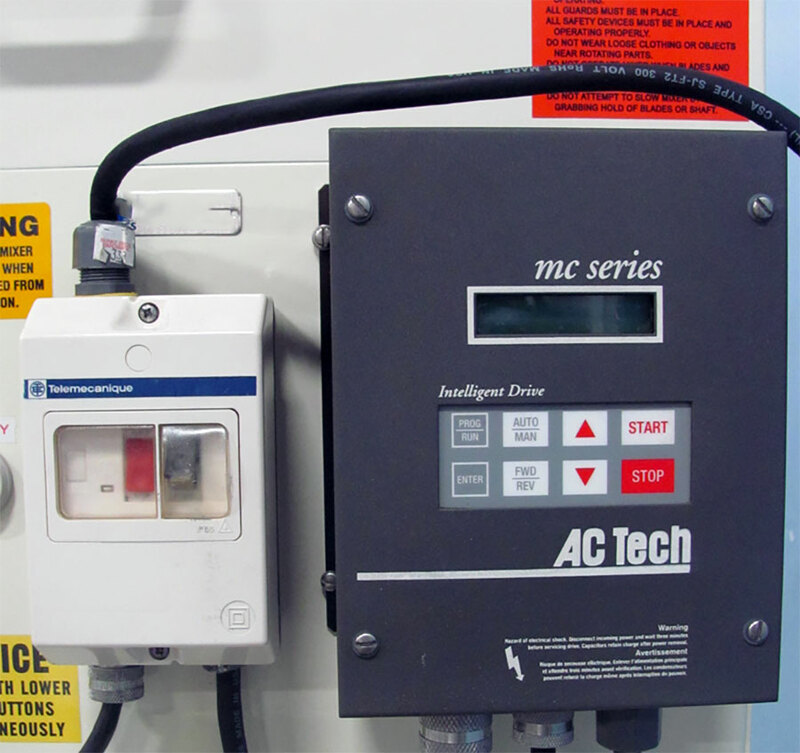 - Agitator is controlled by an ACTech Variable Frequency Drive. 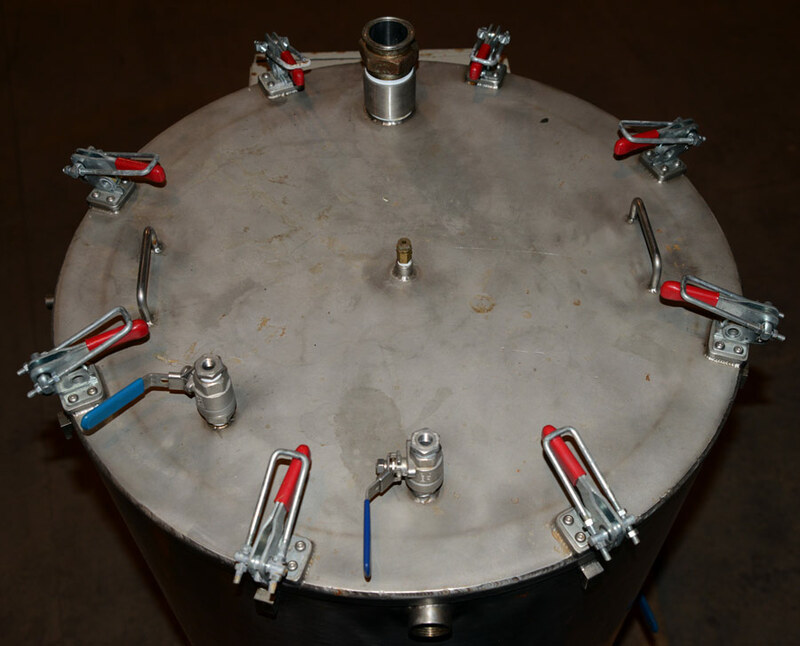 - Tank is fitted with a stainless steel jacket and a side entering thermocouple. 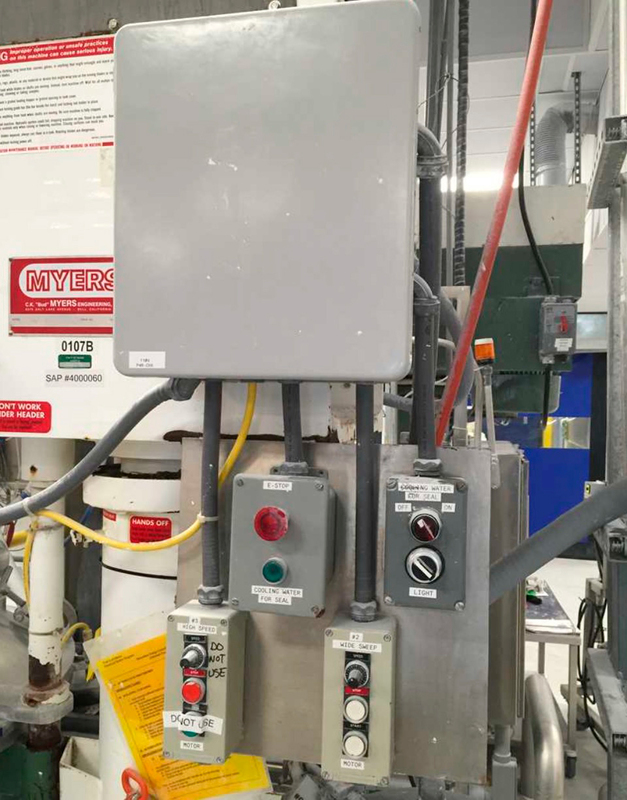 - Drive system and agitators are raised and lowered by a hydraulic lift. 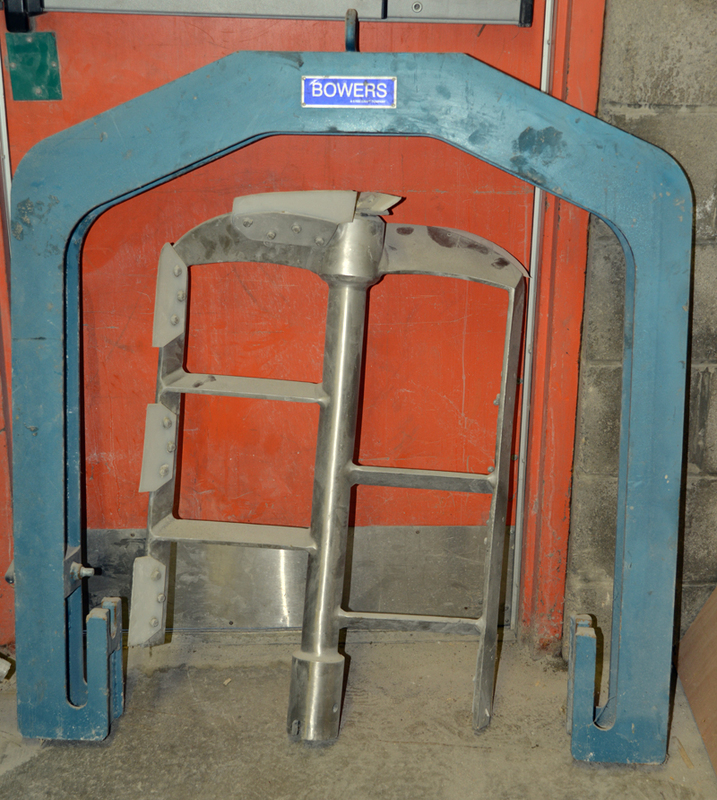 - Mounted on a painted steel bench with casters. 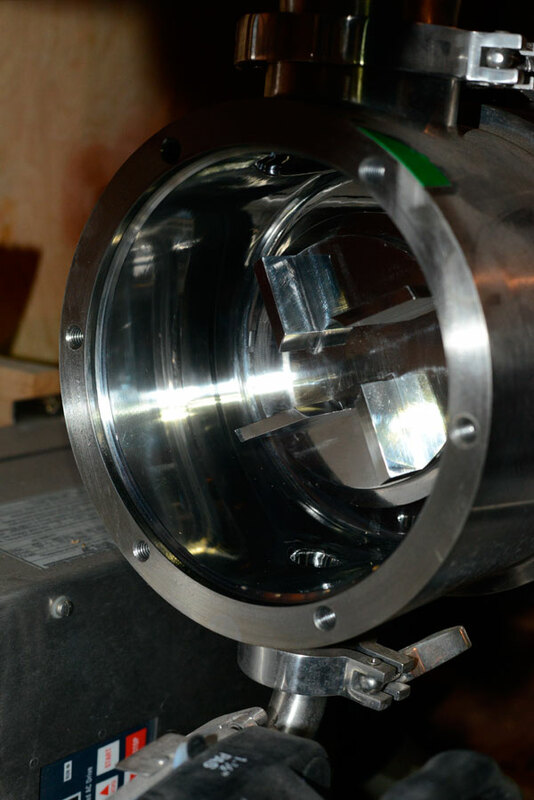 - Fitted with one standard rectangular profiled agitator blade. 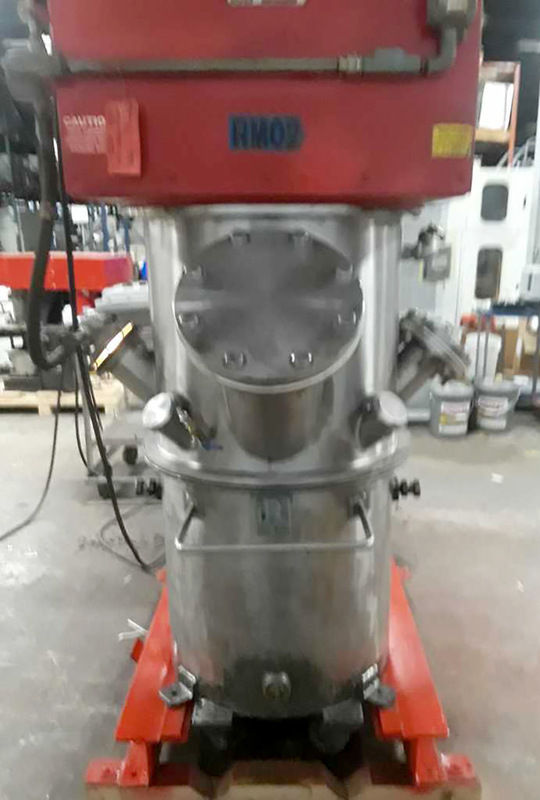 - Fitted with one high speed disperser agitator. 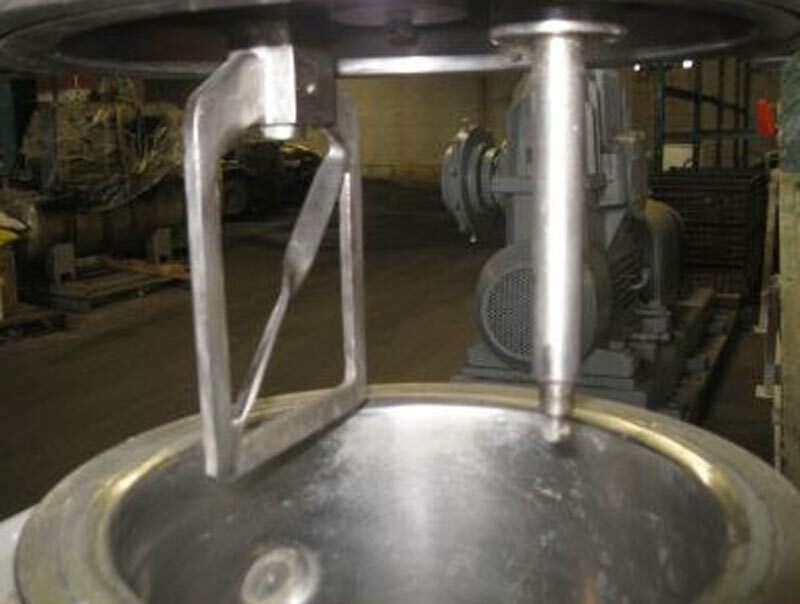 - Scraper blades are provided for both the tank bottom and vertical side. 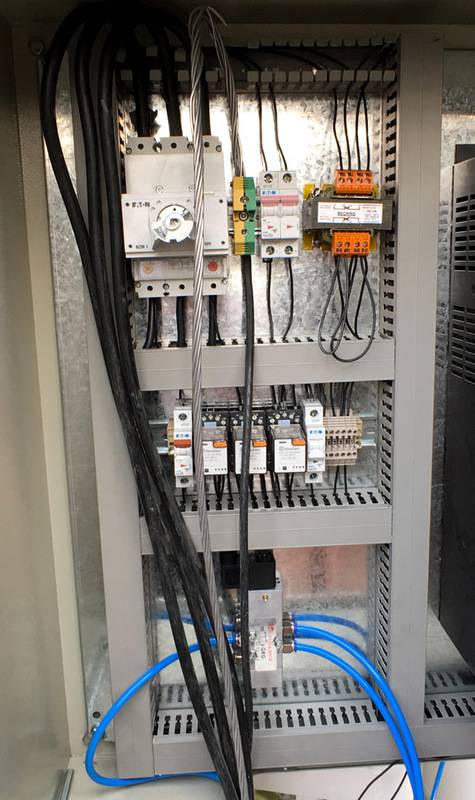 - Each agitator is controlled by a Variable Frequency Drive. 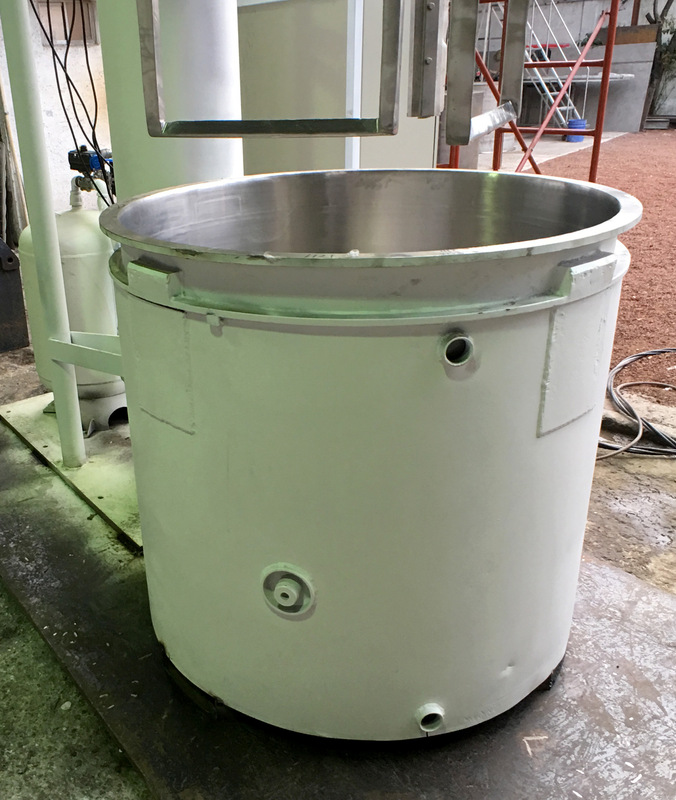 - Tank is designed for use with a discharge press and is fitted with a stainless steel jacket, a cove cut plug valve and a side entering thermocouple. 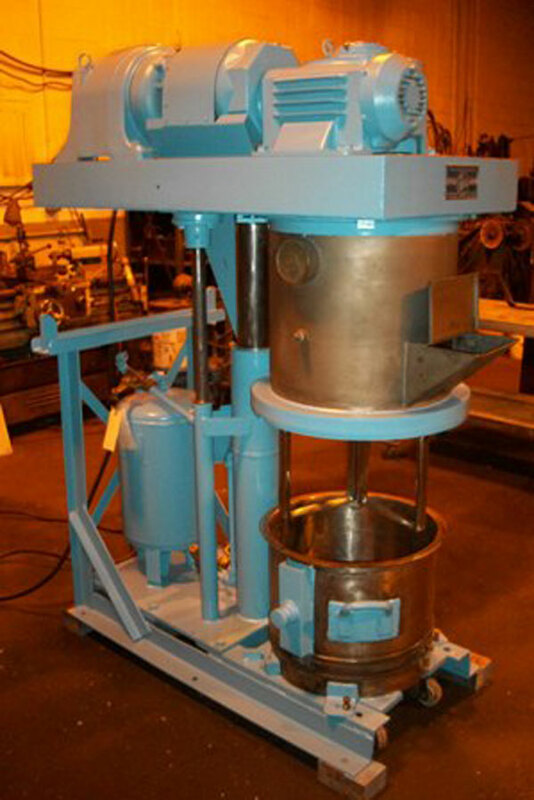 - Discharge press is suitable for discharging product from a suitable 1/2 gallon mix can included with this mixer. 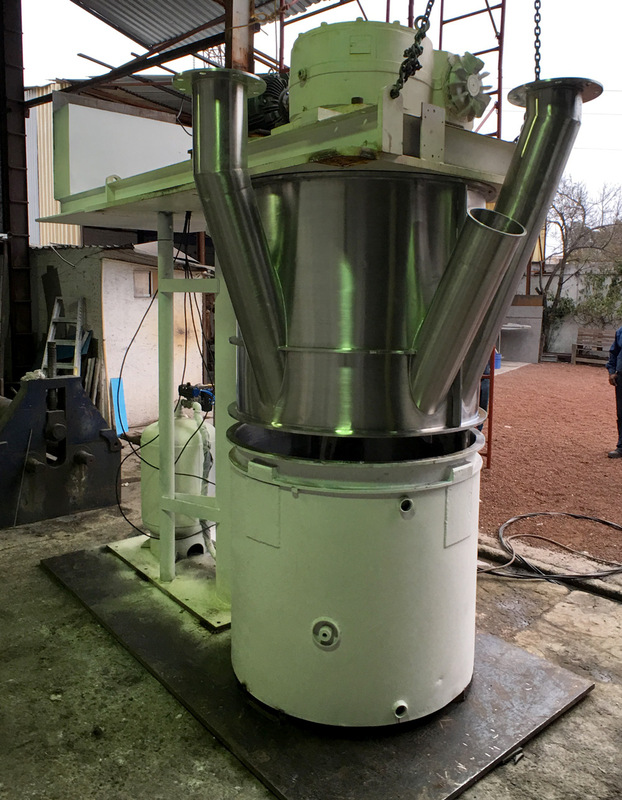 - Press platen is raised and lowered by the included hydraulic power pack. 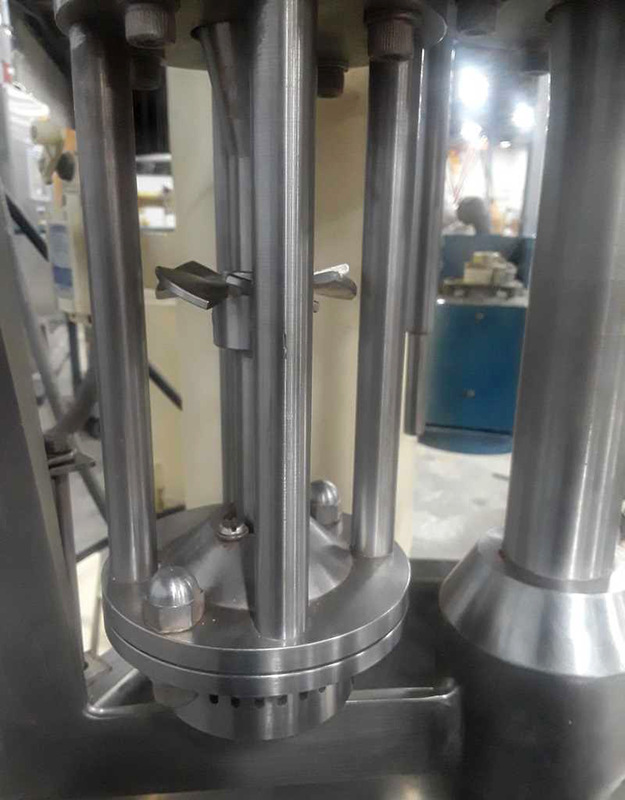 consists of one top-entering centrally located agitator and one top entering homogenizing rotor/stator turbine. Vessel jacket is designed for ab temperature of 151 C and 6 Bars. The unit has an integral hot water heating unit. 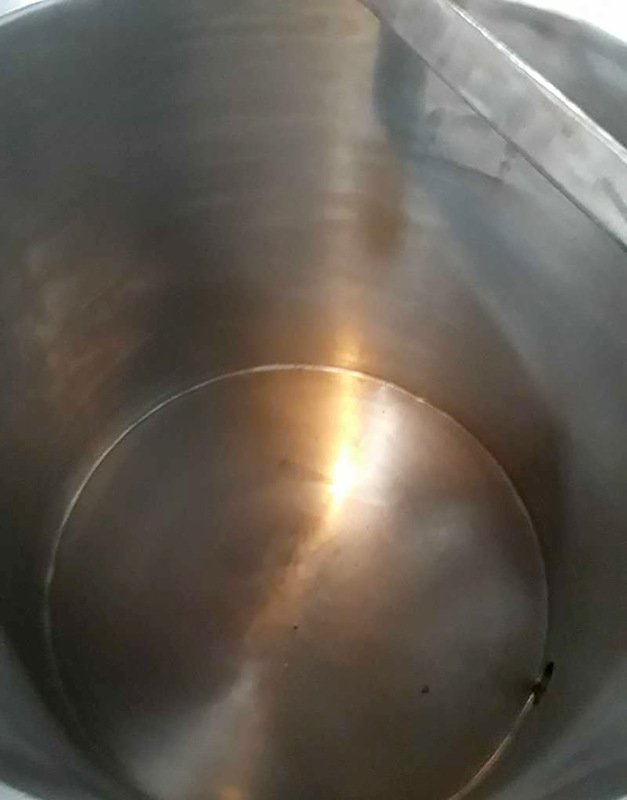 Vessel Cover manufactured of stainless steel. Cover gasket embedded in the cover for vacuum sealing. 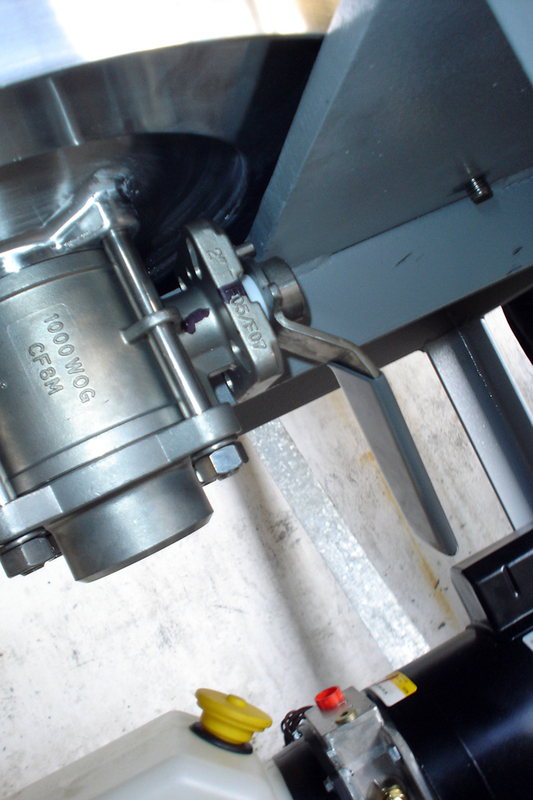 Flange for mounting optional homogenising agitator and for product addition. 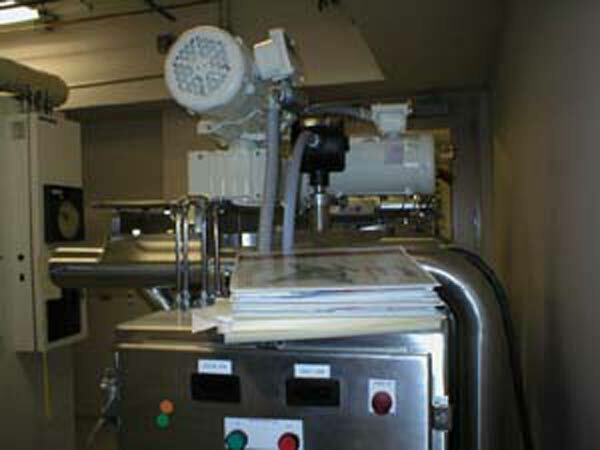 Air-ejector vacuum system installed in the mono-block cabinet. 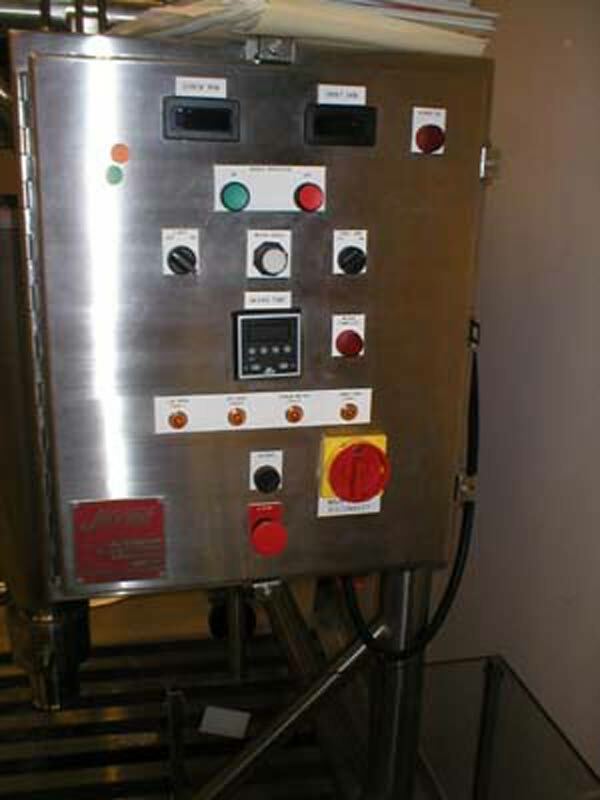 The control panel includes temperature controls for both the product and jacket. Start / Stop and speed control. Fitted with an analog speed readout. 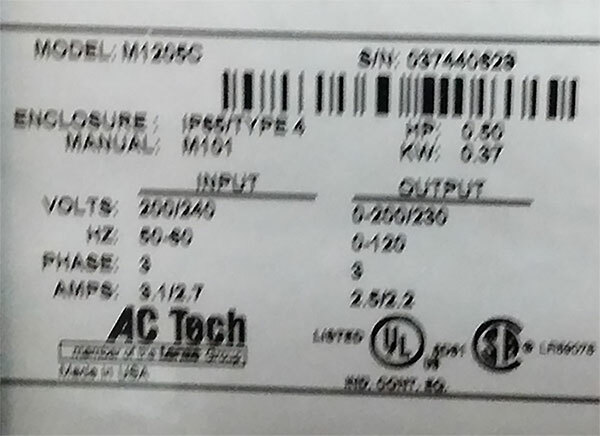 Input Voltage: 110 volts, 1 phase, 60 Hz. 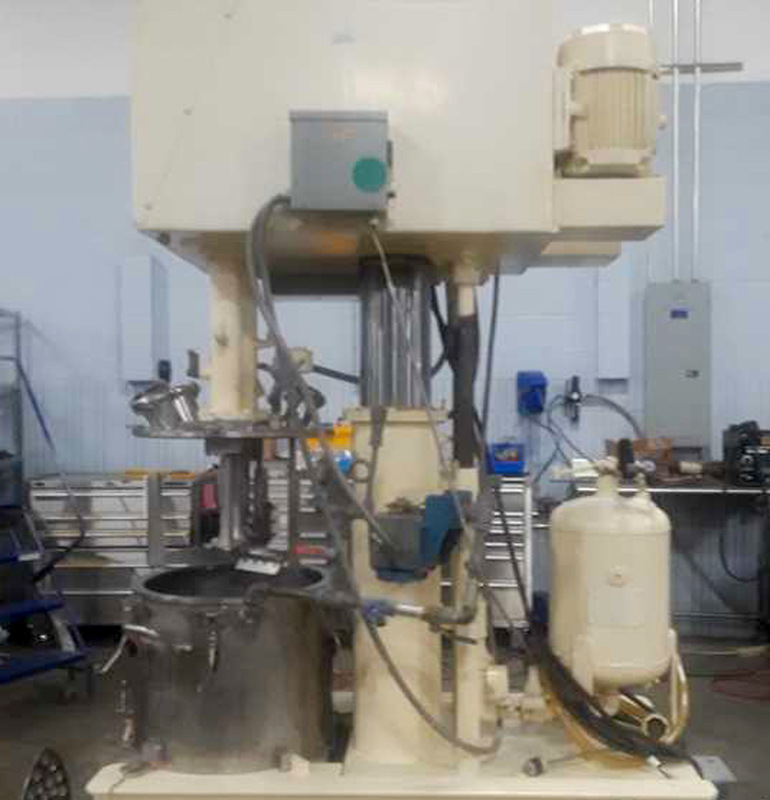 USED ROSS HIGH SHEAR DOUBLE PLANETARY MIXER, MODEL PD-2 GALLON, POWERMIX WITH TWO AGITATORS, ONE LOW SHEAR AND ONE HIGH SPEED DISPERSER. 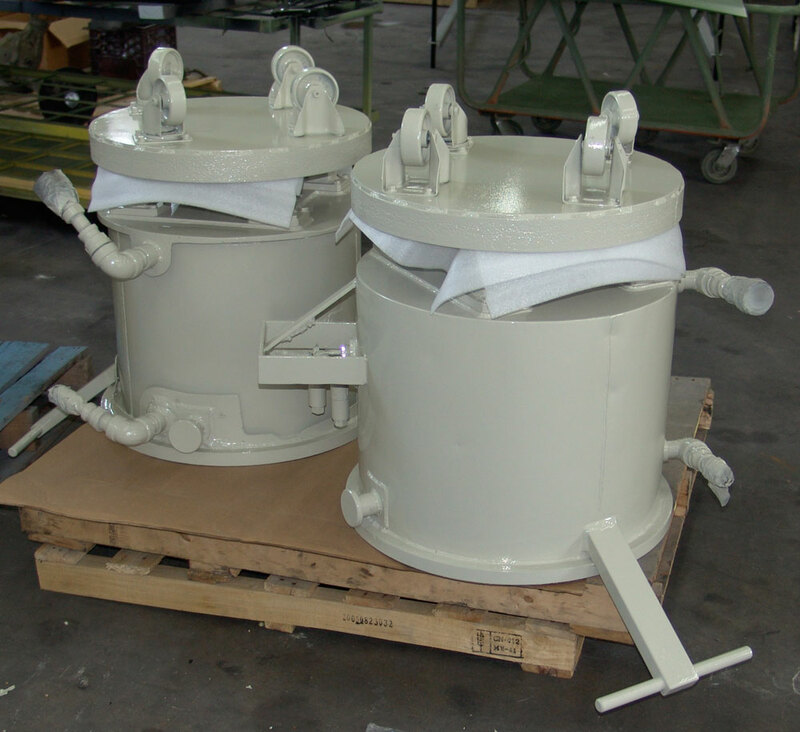 MIXER HAS T-304 STAINLESS STEEL CONTACT PARTS. 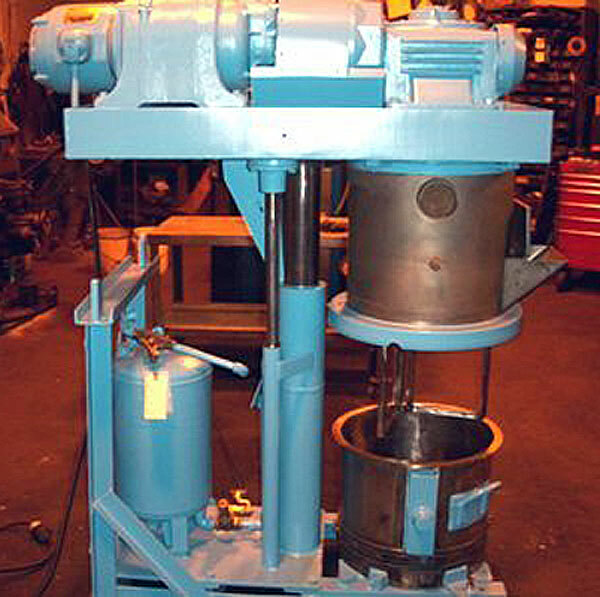 1/3HP EXPLOSION PROOF HYDRAULIC LIFT DRIVE. 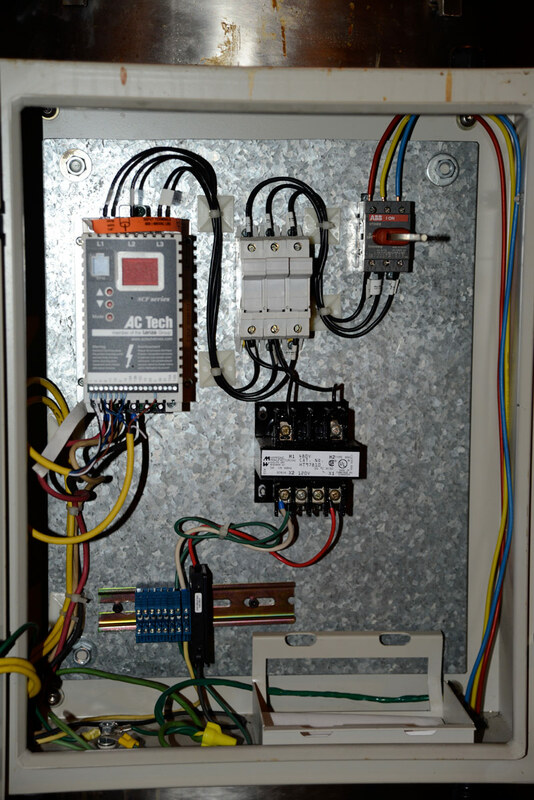 1HP 70-240 RPM VARIABLE SPEED PLANETARY DRIVE. 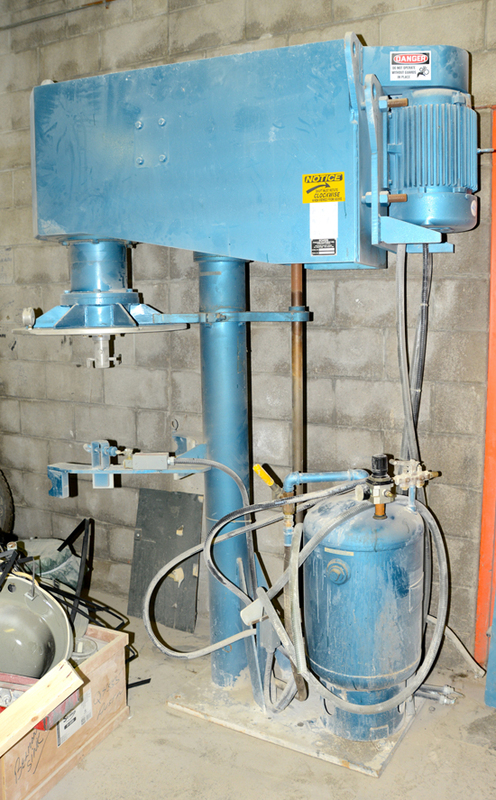 2HP 1140-3420 RPM 3/60 460 VOLT VARIABLE HIGH SPEED DISPERSER DRIVE. 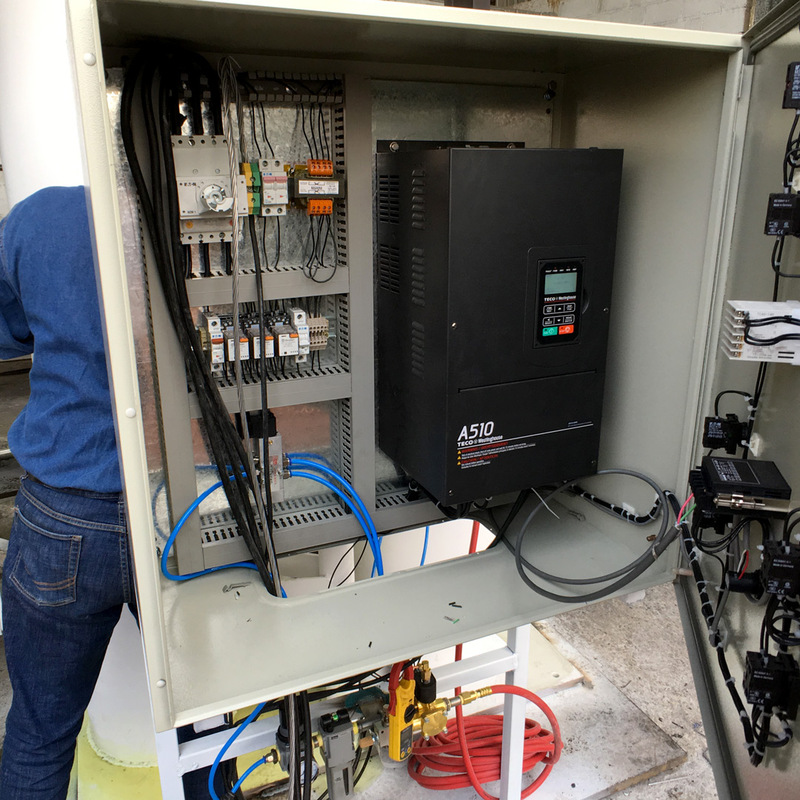 ELECTRIC HYDRAULIC LIFT CHANGE CAN REMOVAL DESIGN. 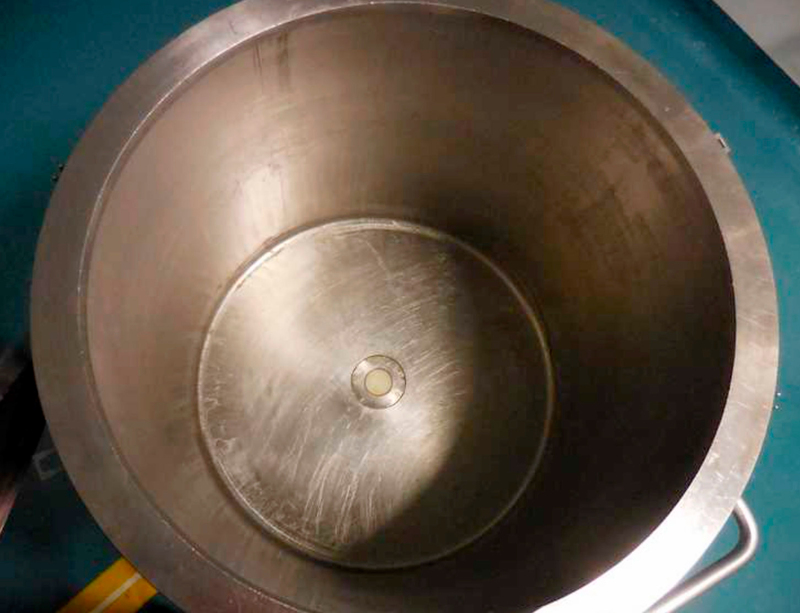 FEATURES VACUUM HOOD ON BOWL. JACKET CHANGE CAN. 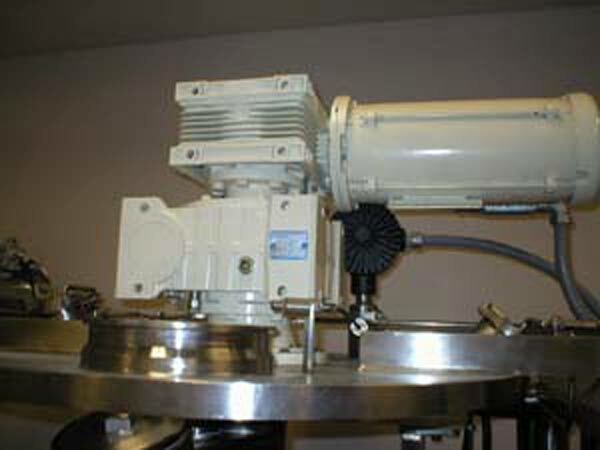 PREVIOUSLY USED IN A LABORATORY. 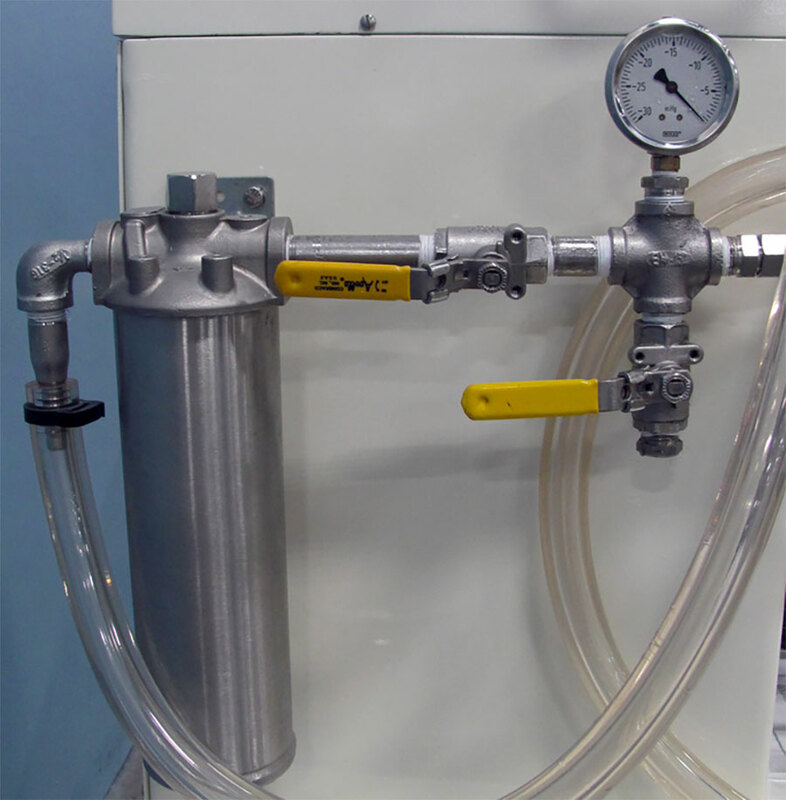 • Designed for operation under vacuum, comes with vacuum pump. 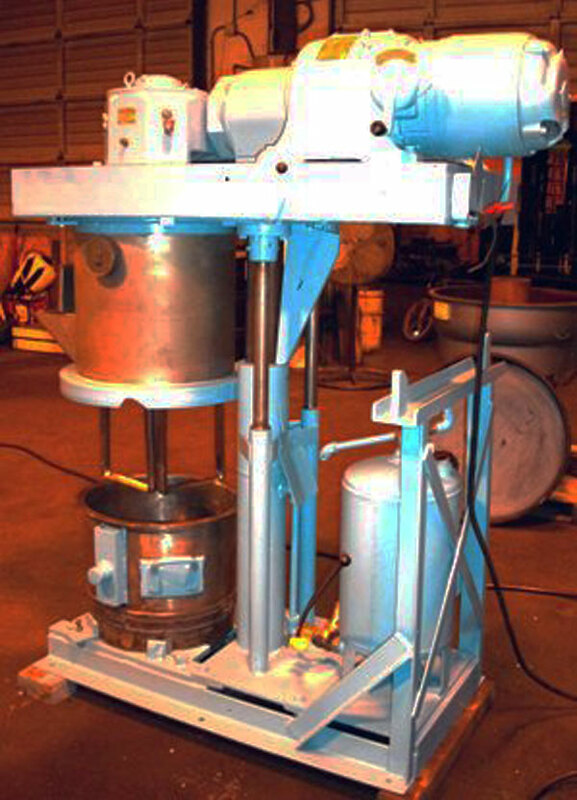 • Mounted on a steel bech with casters. • Older unit but nice looking. 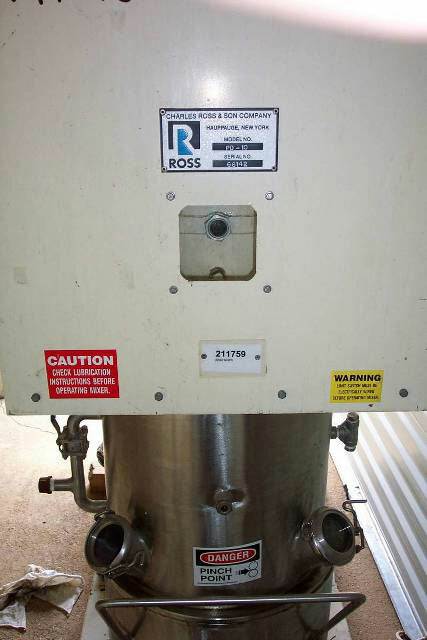 A great example of the longevity of Ross equipment! 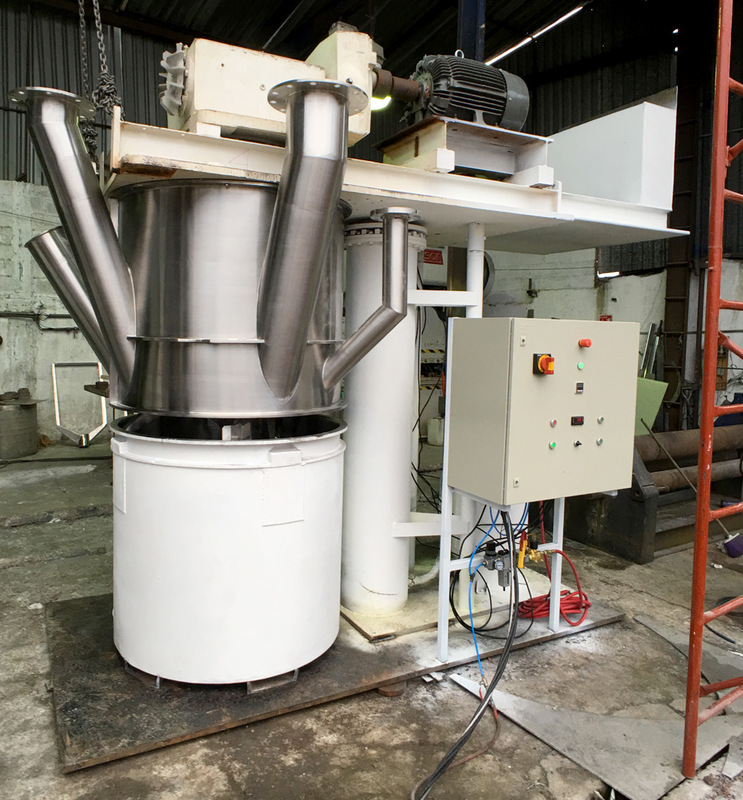 Discharge press for use with Ross 2 gallon mix cans suitable for use with a discharge press. 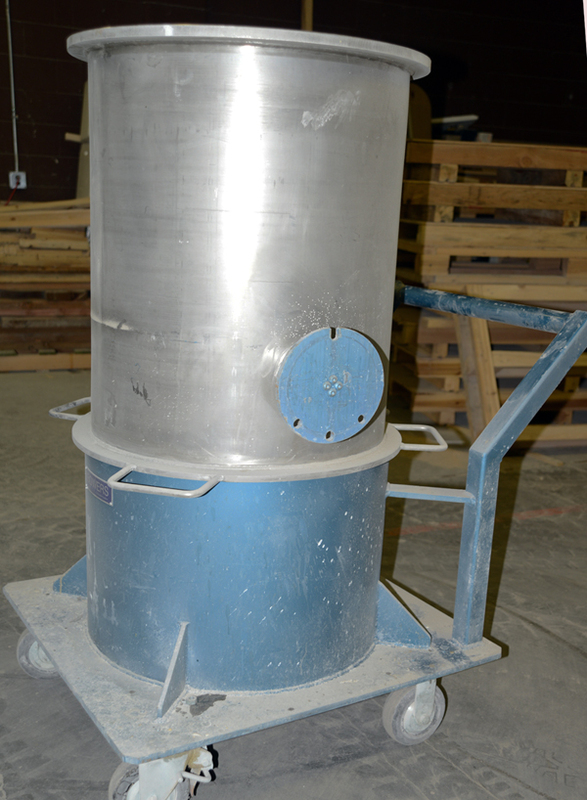 - Mixer comes with one jacketed mix can with a thermocouple, bottom discharge and casters. 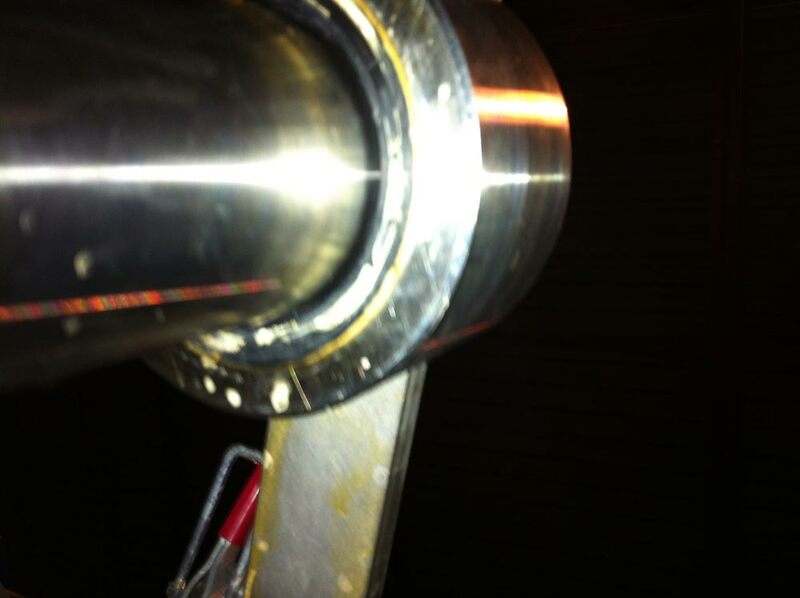 -Two sets of agitator blades with one pair being the standard and the othe paur being flat plates. We rebuild, click here to see typical examples of the work we do. 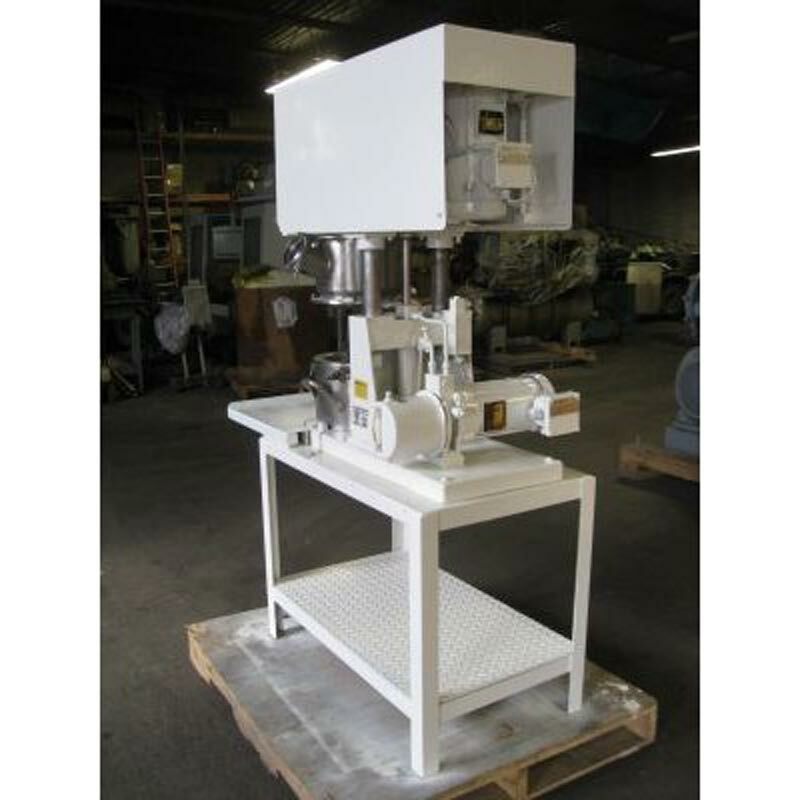 Click hereVisit our packaging equipment page. 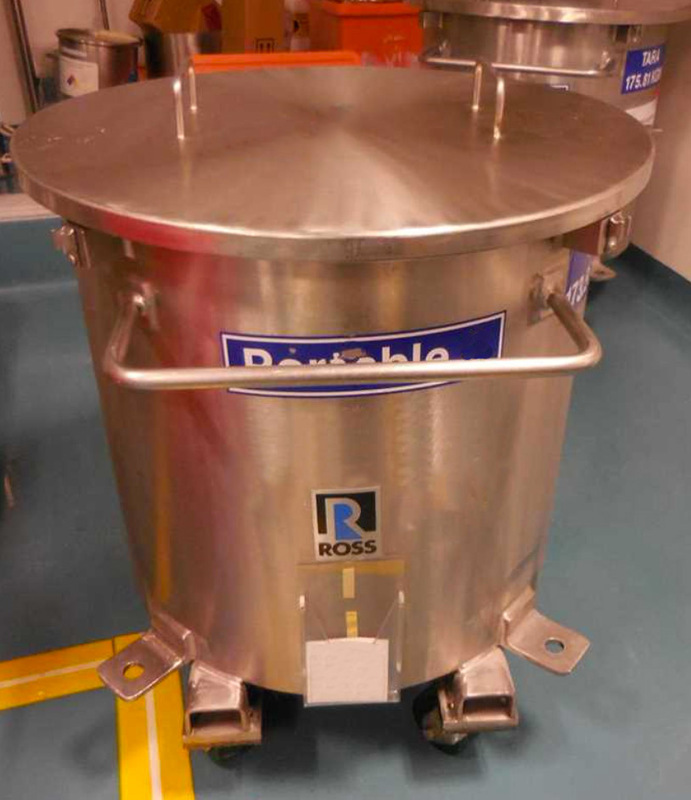 Ross LDM-4 Gallon double planetary mixer. 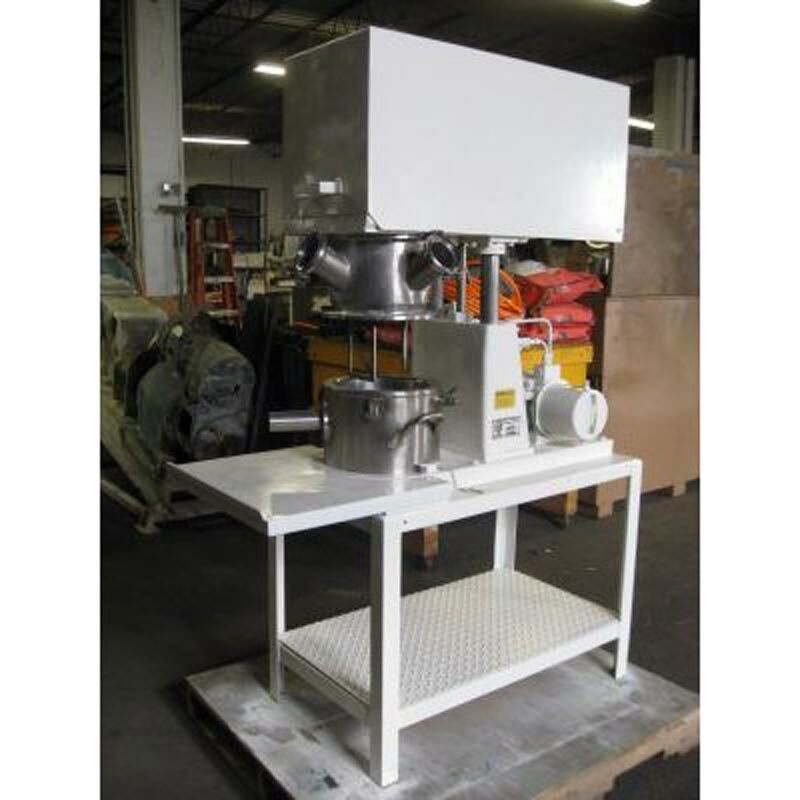 • New Archem discharge press for use with either Ross or Archem 4 gallon mixers. 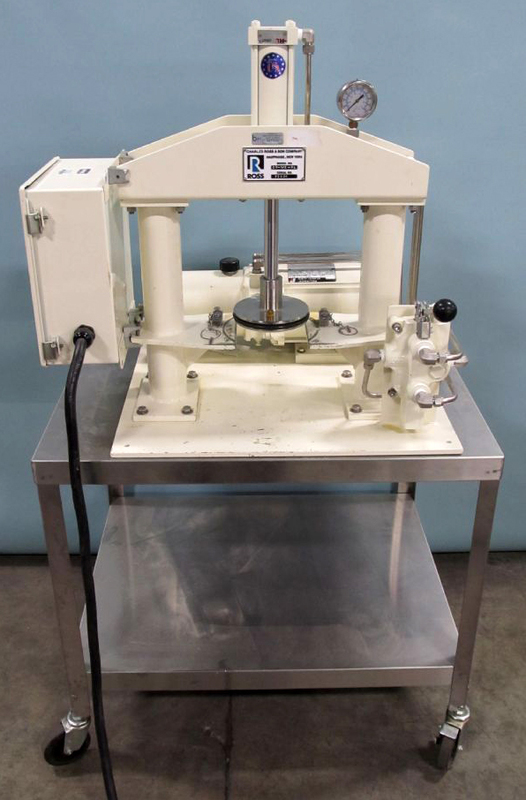 Click here to see this press in operation downwards. 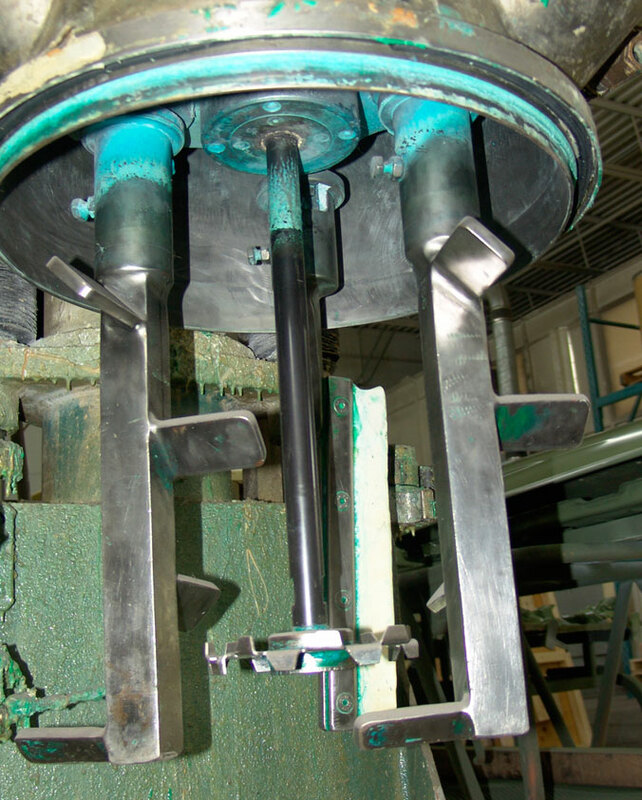 Click here to see this press in operation upwards. 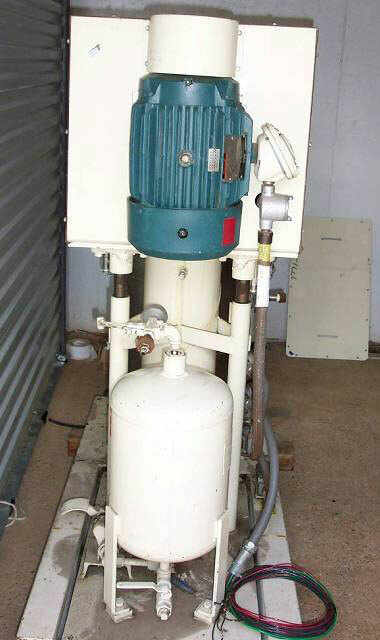 - Comes with a flat bottom tank and a cone bottom tank. 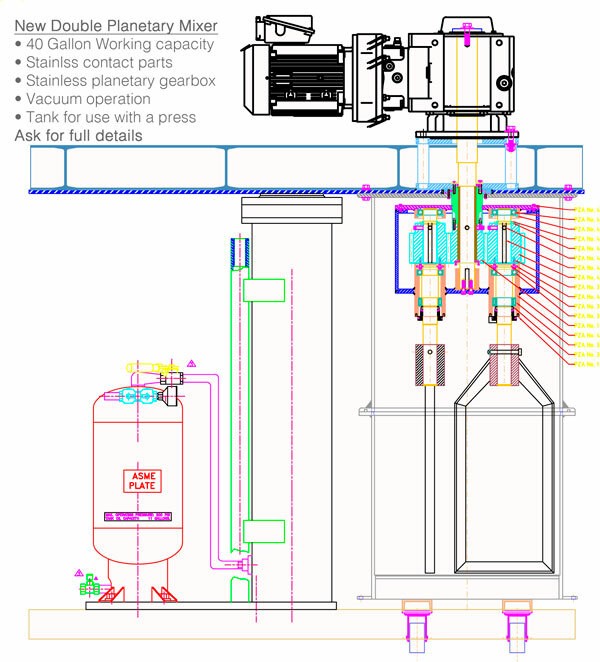 - Tank is fitted with a stainless steel jacket, a discharge valve. 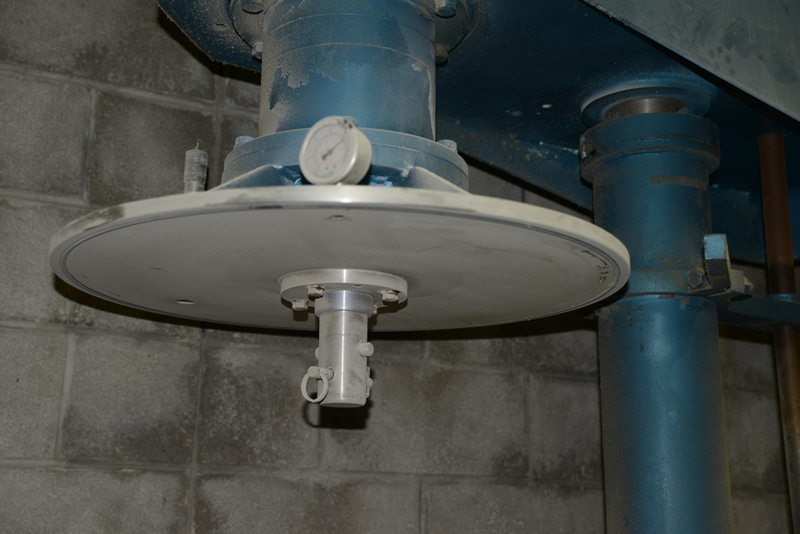 • Le couvercle avec les agitateurs se lève et se baisse avec l'aide d'un système de levage hydraulique activé pair une source d'air comprimé. • Le couvercle est muni de 2 hublots, une sortie pour évacuer l'air avec une jauge à vide. 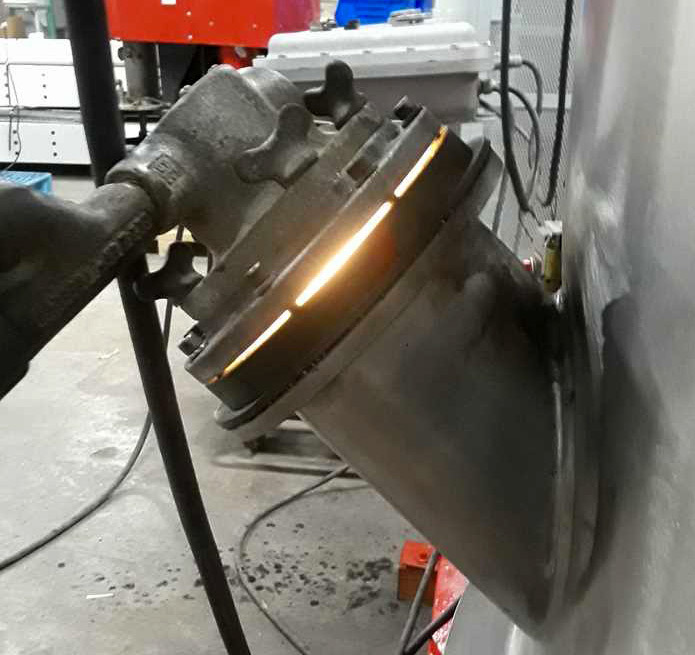 • La cuve à une chemise chauffante en acier inoxydable conçue pour une pression de 50 livres/pouces carrés. • Ce mélangeur fut antérieurement utilisé pour faire des crèmes pour soins personnels. • Ce mélangeur a été vérifié et fonctionne bien. J'en ai vu le vidéo. SOLD, we need another unit. Sell us yours. 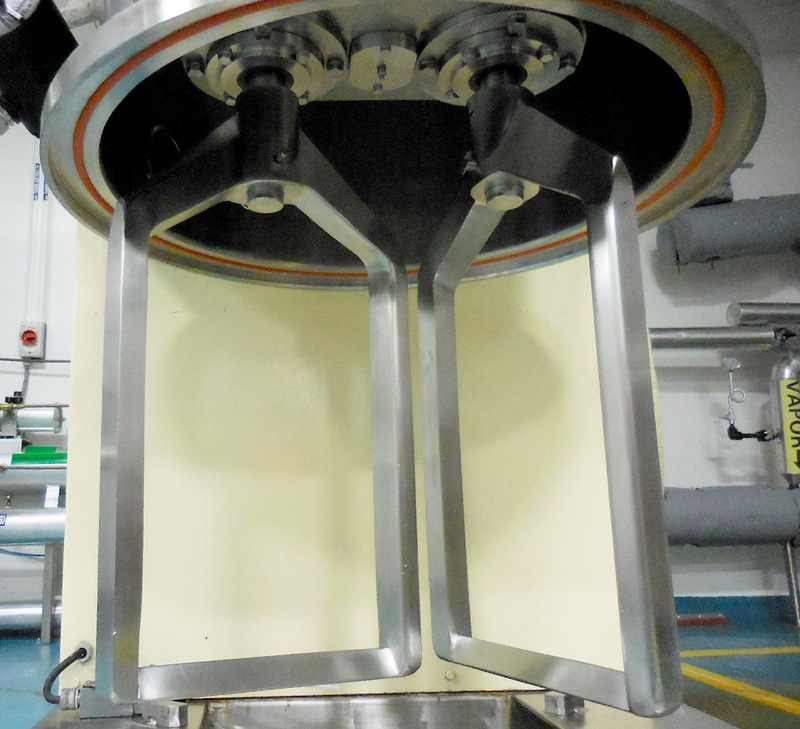 Another kind of planetary mixer with its own advantages. 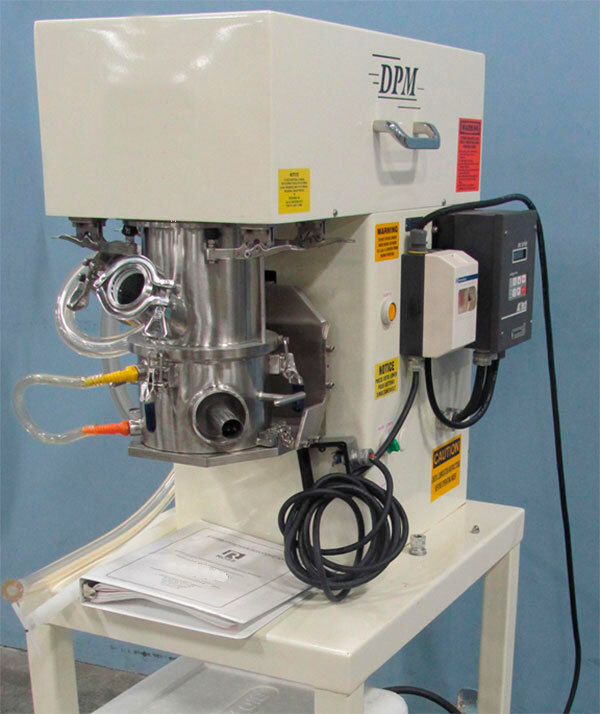 This mixer will perform better than a double planetary mixer giving much better and faster top to bottom mixing than a double planetary mixer. I will also mix a a much smaller relative partial batch. 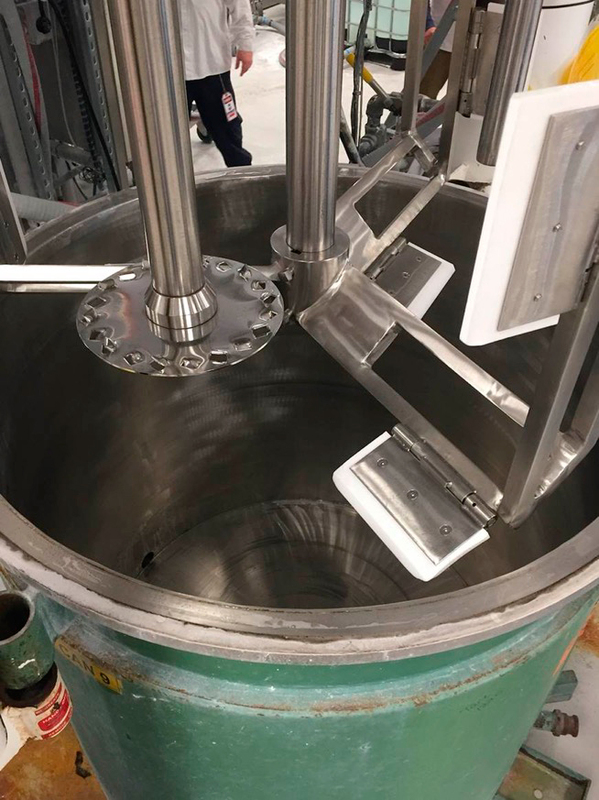 Discharge is easier with its conical shape and emptying can be accelerated by reversing the rotation of the auger to puch the product down and out the bottom outlet. 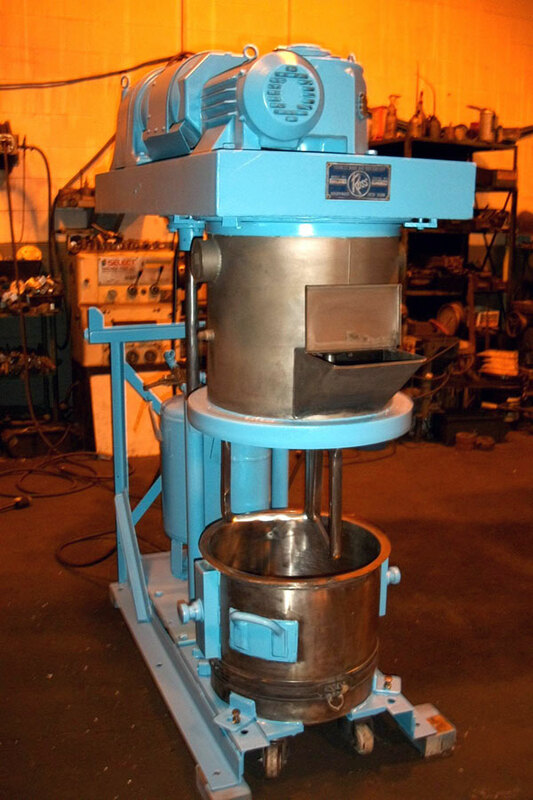 This may be a good alternative to a double planetary mixer. 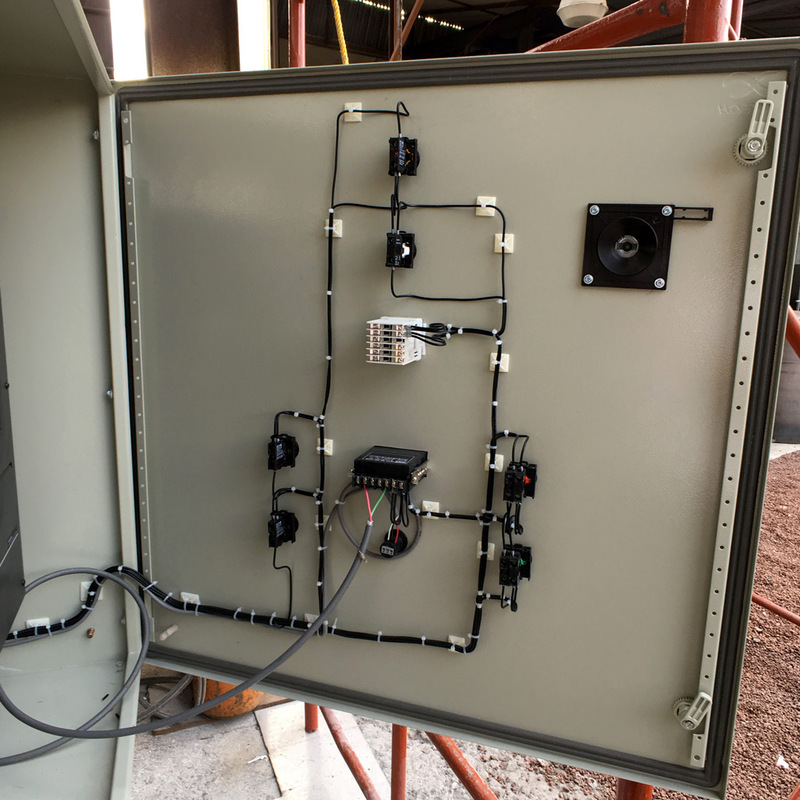 Runs on 230 volts, 3 phase, 60 Hz. Formerly used by a pharmaceutical company. 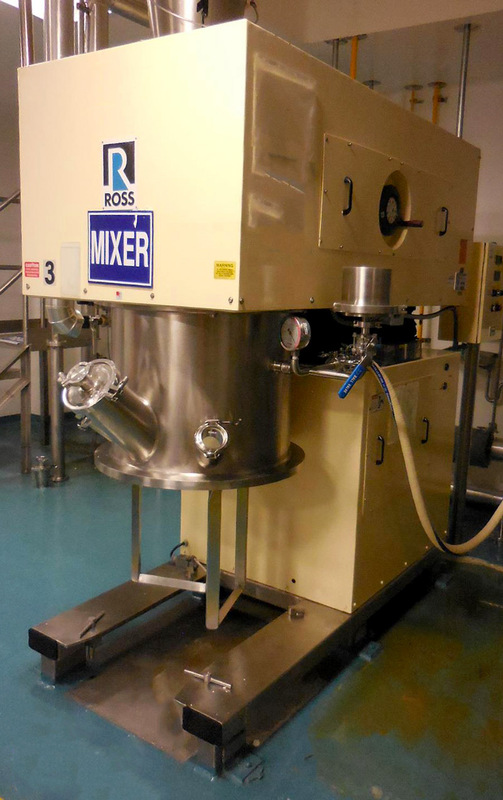 • Ross HDM-10 Double PlanetaryMixer. 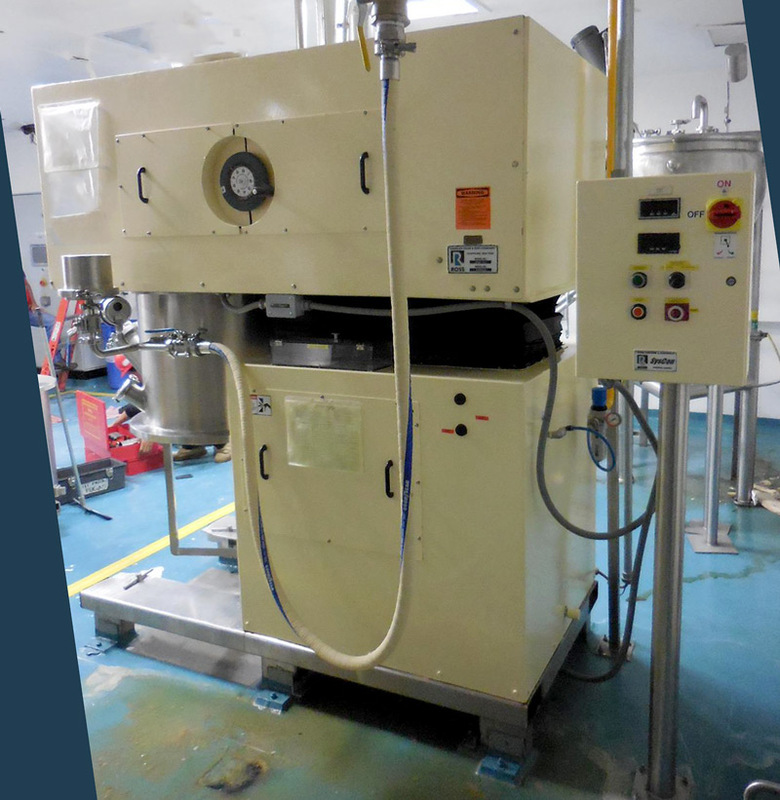 Click here to see a video of the unit in operation. 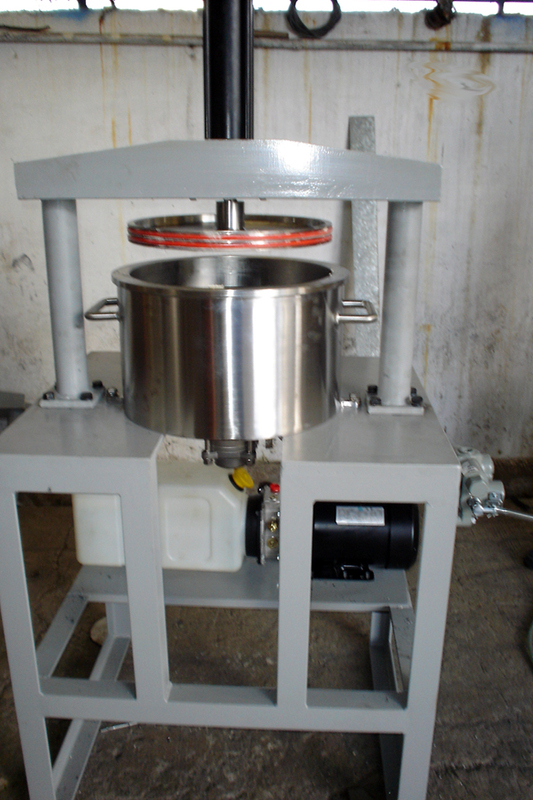 Mix Cans: Two vacuum jacketed mix cans with centrally located flush ball valve and thermocouple. 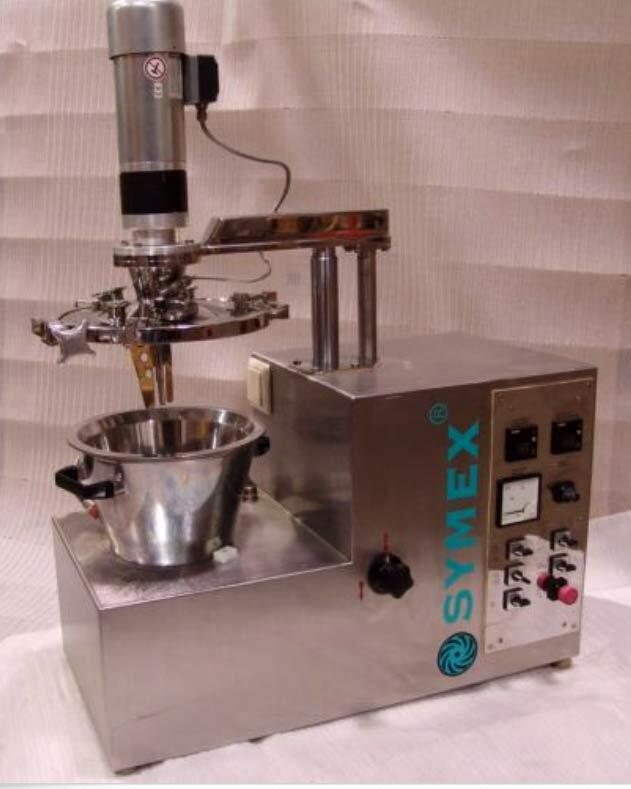 Each mix can has a removable base with casters. 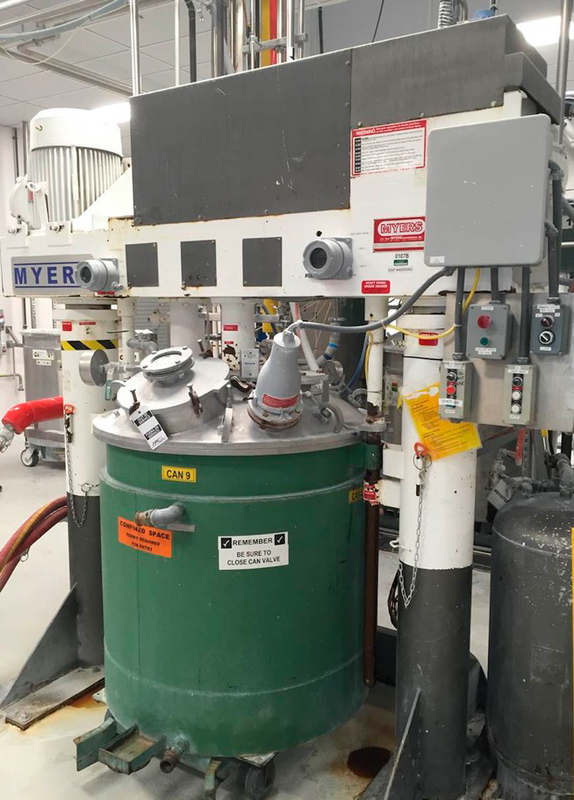 Agitators: Two planetary agitators with pitched blades and one centrally located high speed disperser. There are two spare planetary agitator blades. 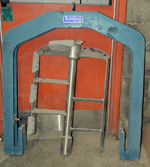 Scrpaer: There is a scraper arm assembly which is included but it is not show in the photos. Spare Parts: Comes with a spare planetary gear box and some spare mixing blades. 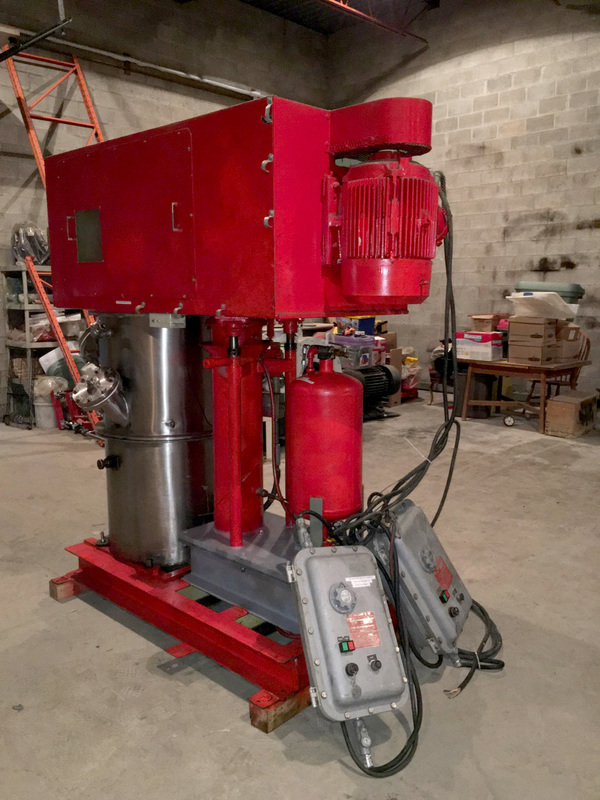 Sold, we have another being refurbished. • Two rectangular profile mixing blades. 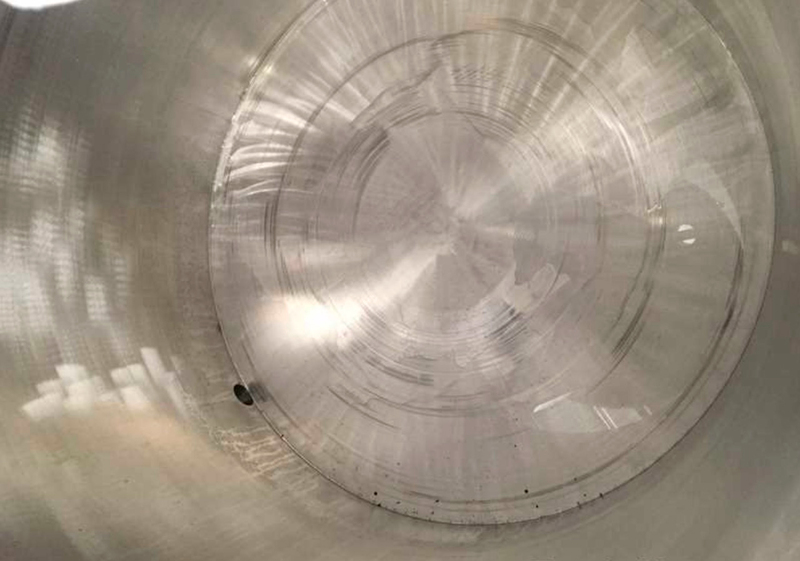 We can make our improved HV-Type High Viscosity blades if required. 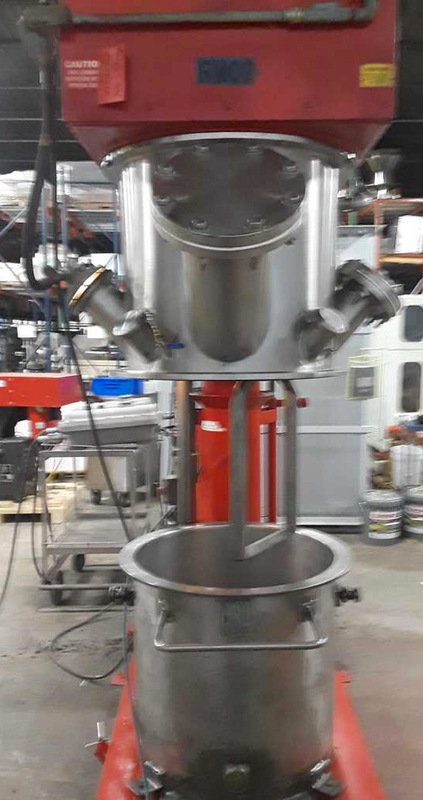 •Unit comes with one stainless mix cans with a flush plug valve on the bottom. 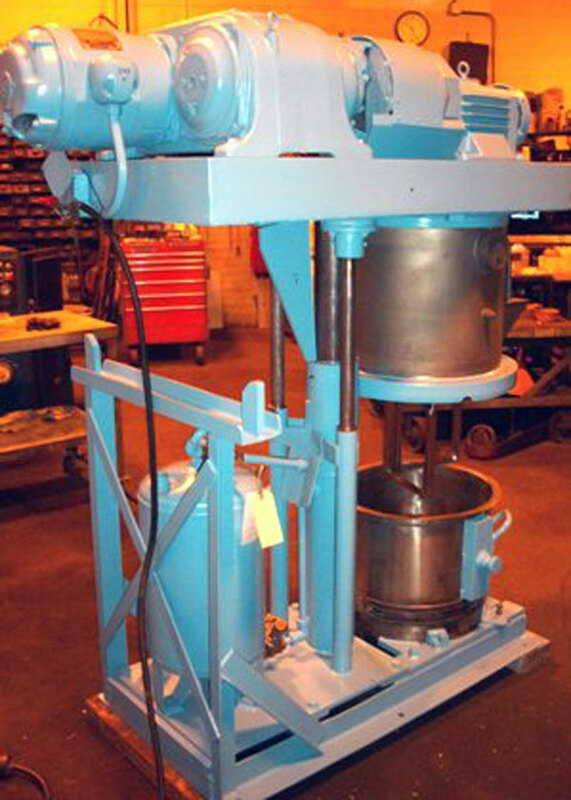 This mixer is being built for stock and is available for purchase & it can be customized. 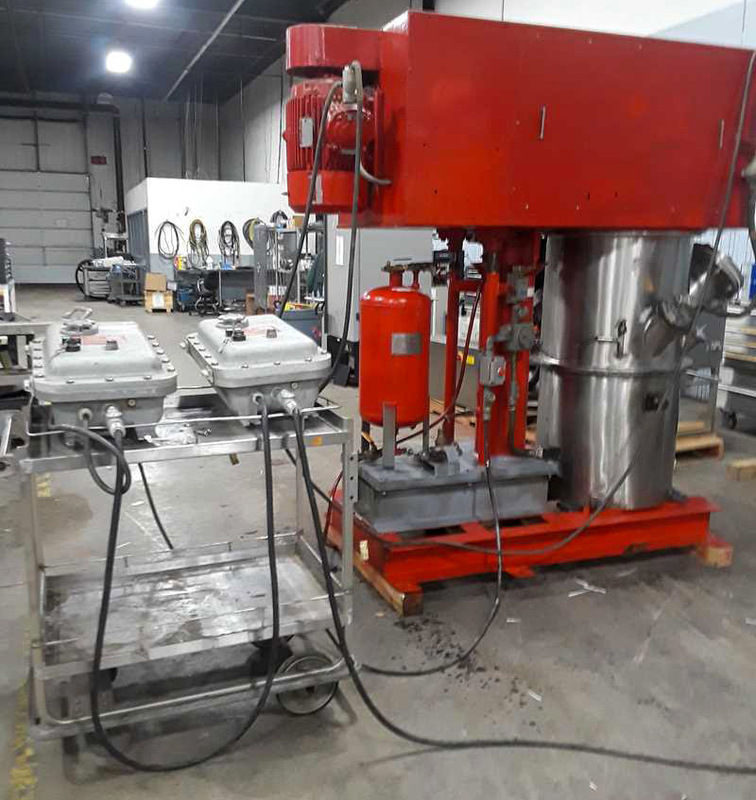 Tank & Discharge Press for us with 40 Gallon Ross Mixer We have been making our own tanks and presses for the useds Ross mixers we sell for nearly 20 years. 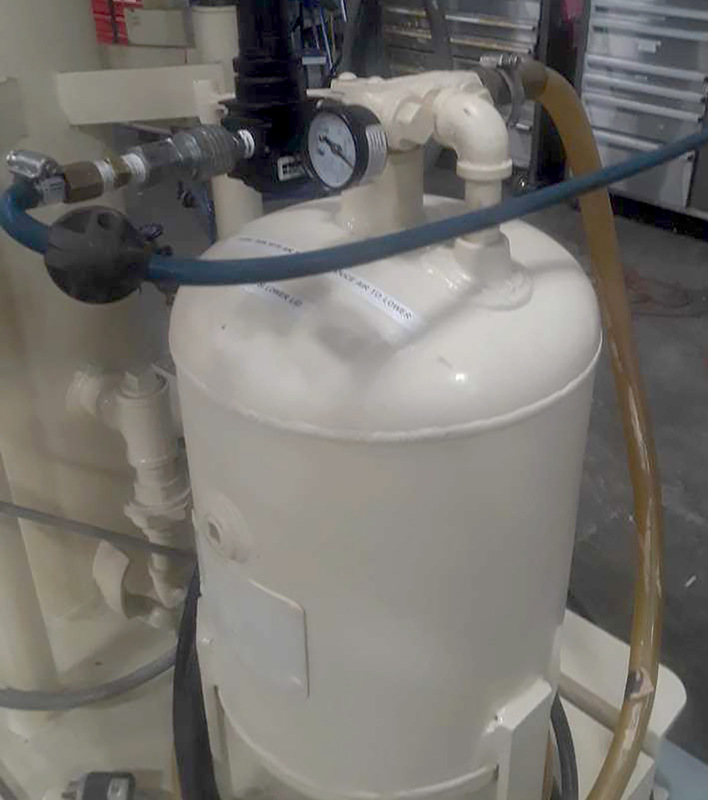 The video link at left will show you a recently made 40 gallon tank and press. 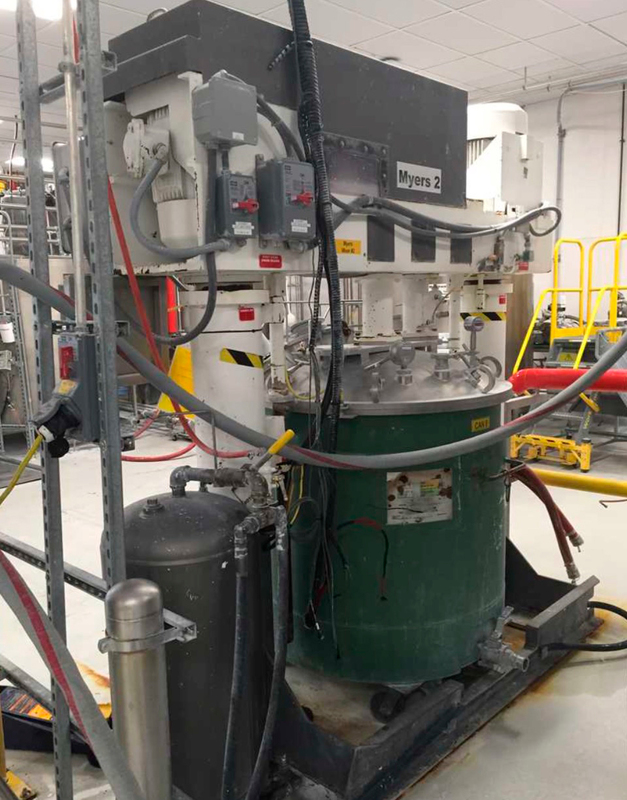 40 Gallon Press in action. 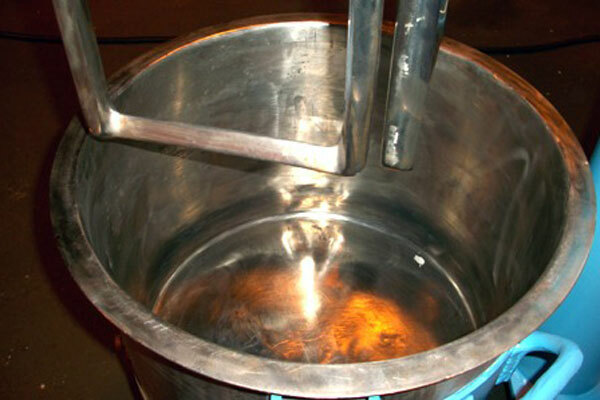 • Mixer was new in 2005 and used for only 2 to 3 years and the product manufacturing was dropped. 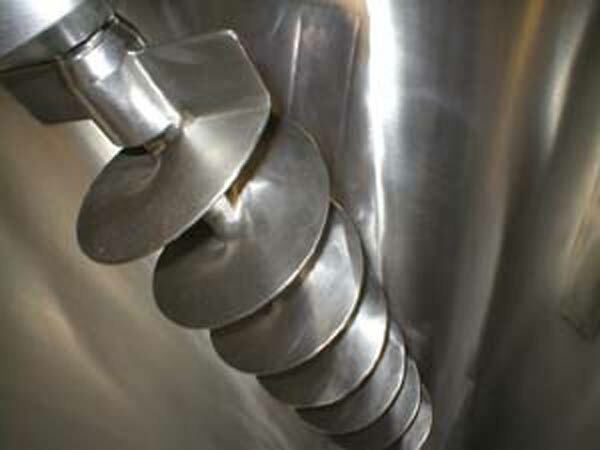 • Product contact parts are made from type 304 Stainless Steel except for the polyethylene scrapers. 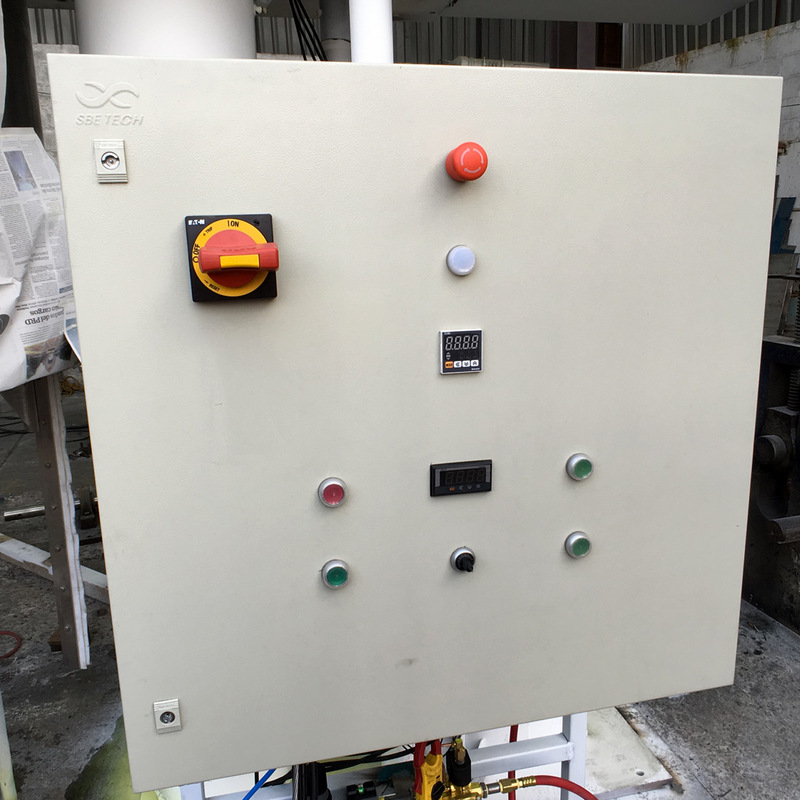 • Agitator speed is controlled by a Variable Frequency Controller. 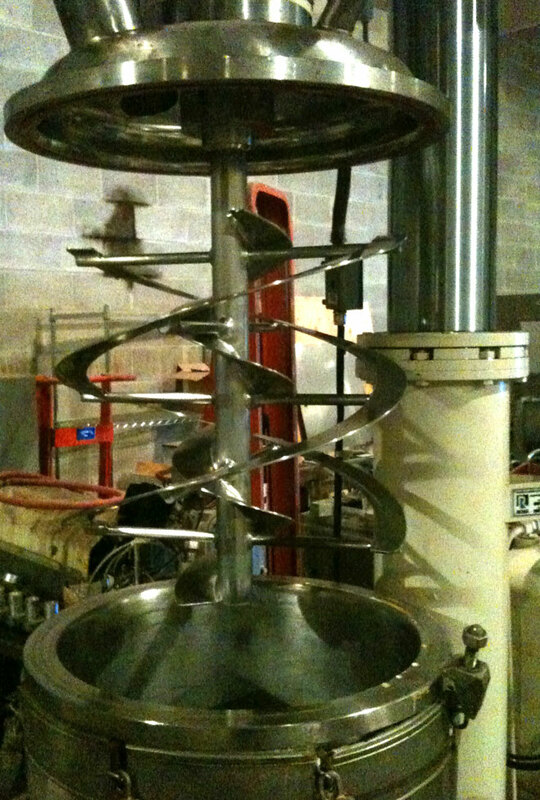 • Anchor agitator is of a quick release design. • Change can design. 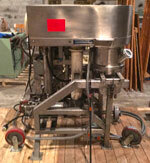 Comes with a cart to hold and move the tank from and to the mixer and other locations. 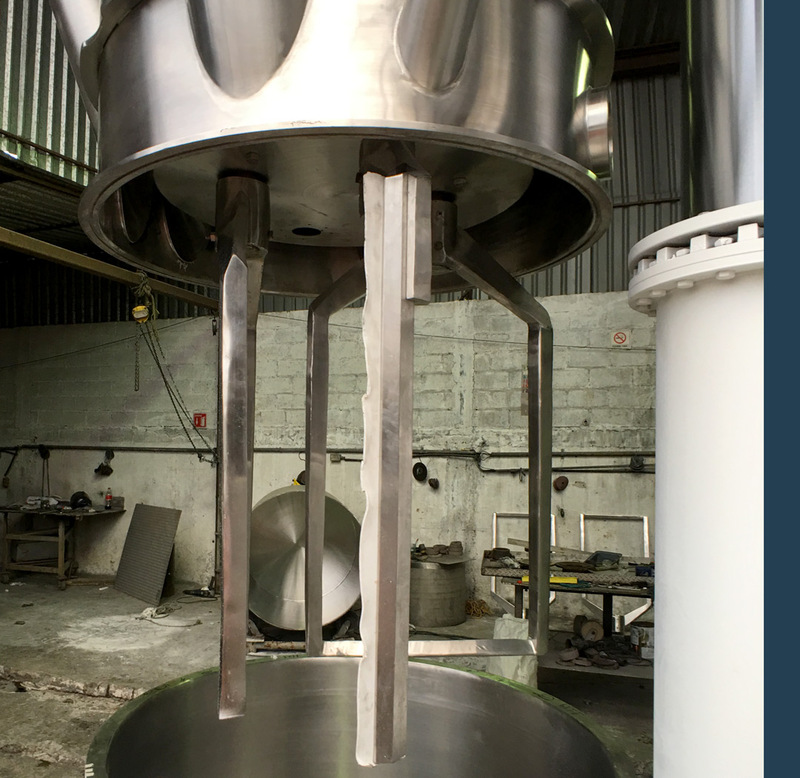 • Comes with 1 mix can with a dished bottom and a 4 inch PMB flush ball valve, and lifting lugs for lifting with tank lifting assembly. 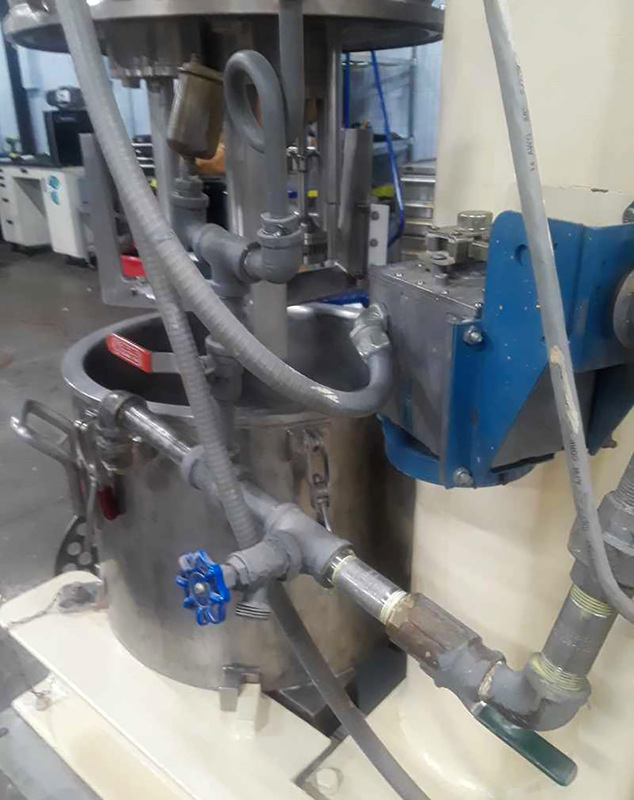 • Comes with tank lifting assembly to be used to lift the tank for manoeuvring above place of discharge like moulds by customer's overhead lifting device. 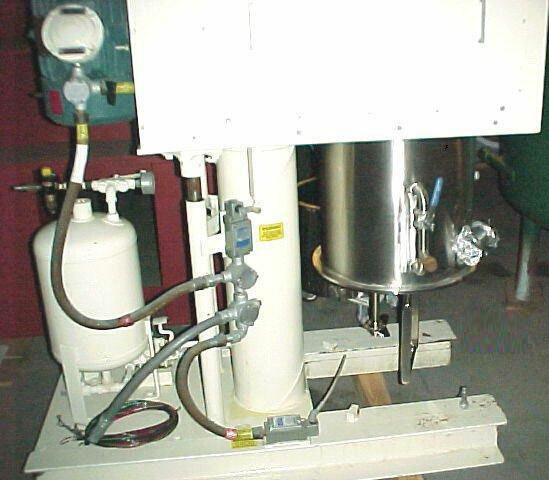 • Agitator drive and vacuum hood are raised and lowered by the air over oil hydraulic lift system. 1-USED ROSS APPROX. 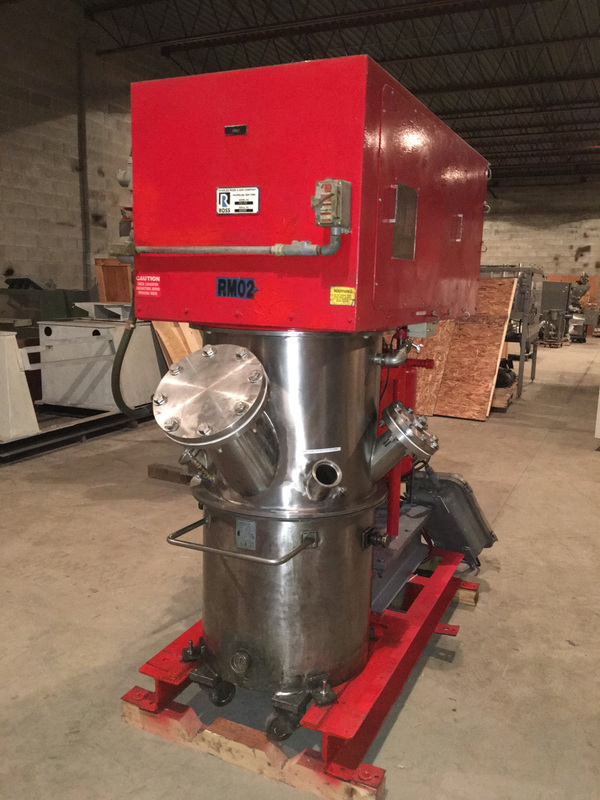 40 GALLON VACUUM MIXER REACTOR EITH DOUBLE HELLICAL AGITATOR. 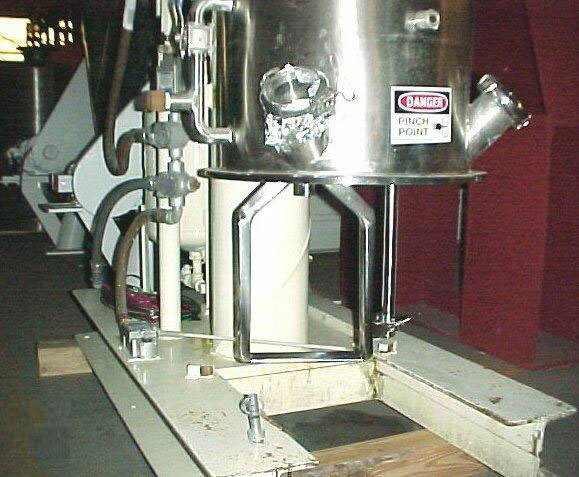 UNIT HAS AIR/OIL LIFT MECHANISM TO RAISE AND LOWER THE DRIVE TO ALLOW THE REMOVAL OF THE MIX TANK. 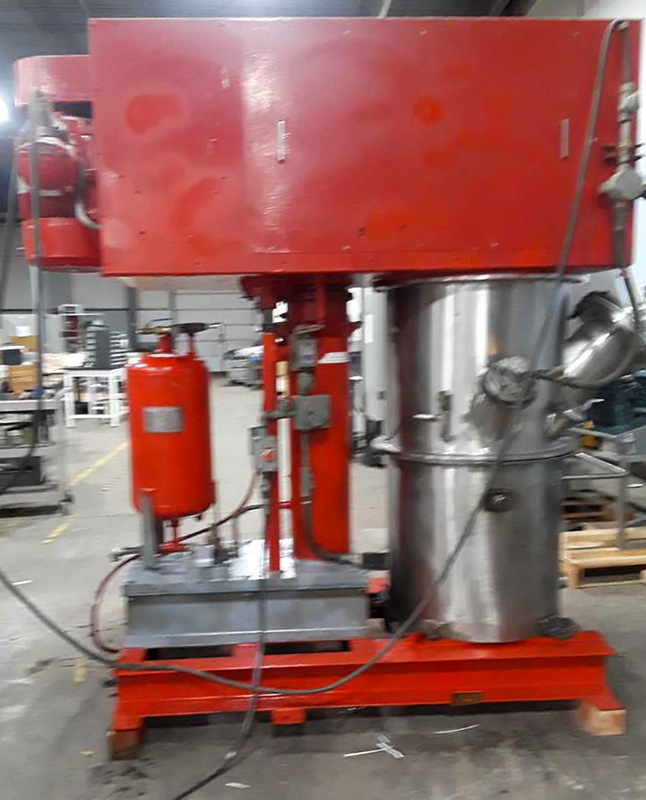 DESIGNED FOR OPERATION UNDER VACUUM & A POSITIVE PRESSURE OF 35 PSI @ 350°F, JACKET MAXIMUM ALLOWABLE WORKING PRESSURE 100 PSI @ 350°F. 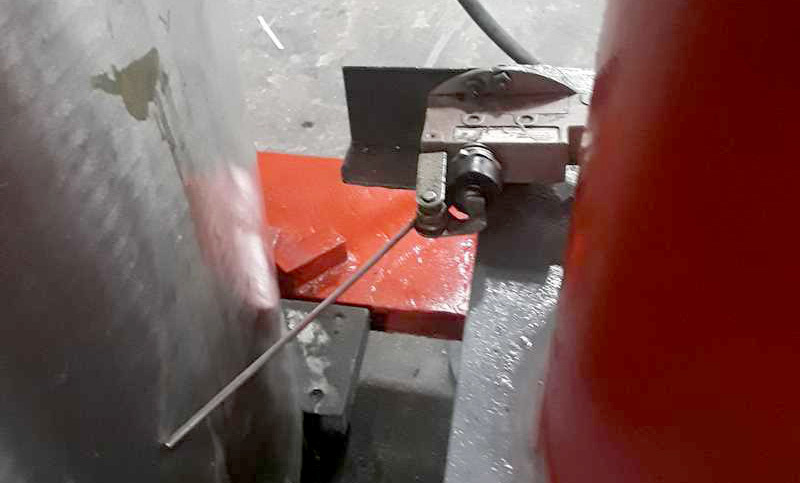 MINIMUM DESIGN METAL TEMPERATURE 0°F AT 100 PSI. 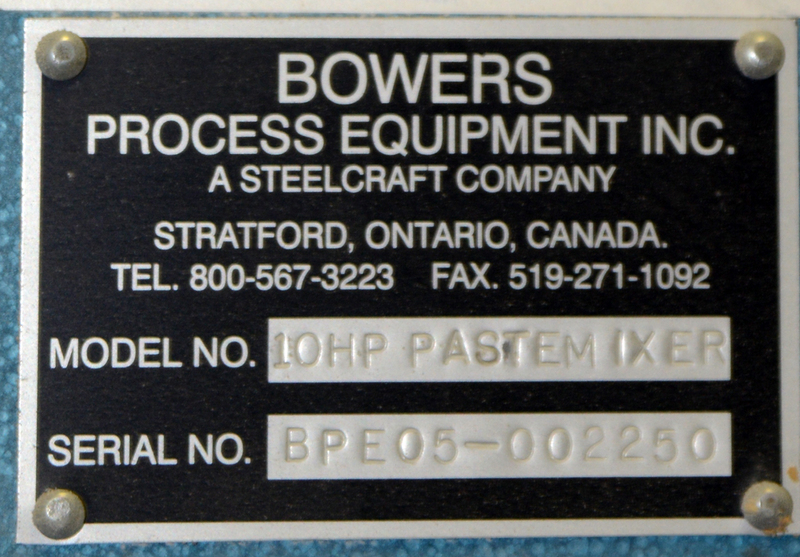 ROSS METAL FABRICATORS S/N 11801-1, national board 463, CRN 15925. 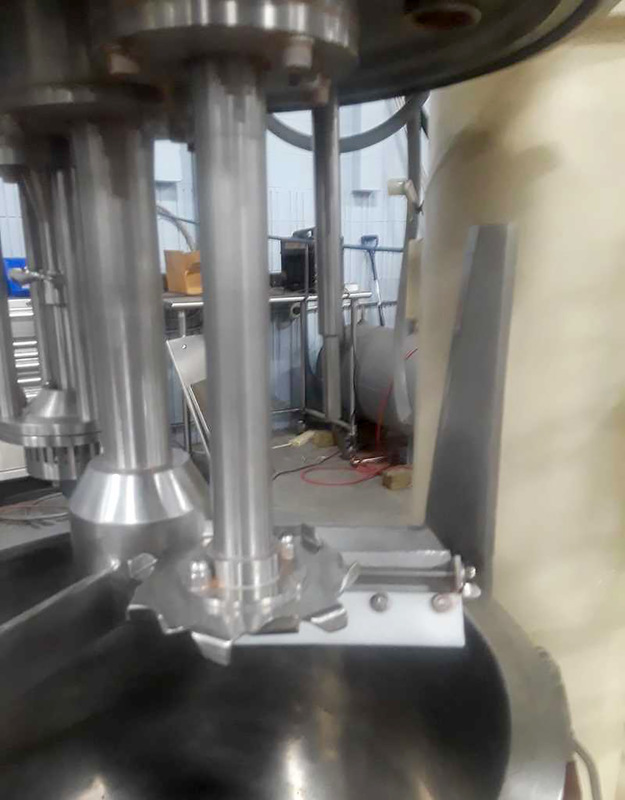 STAINLESS STEEL CONTACT PARTS. 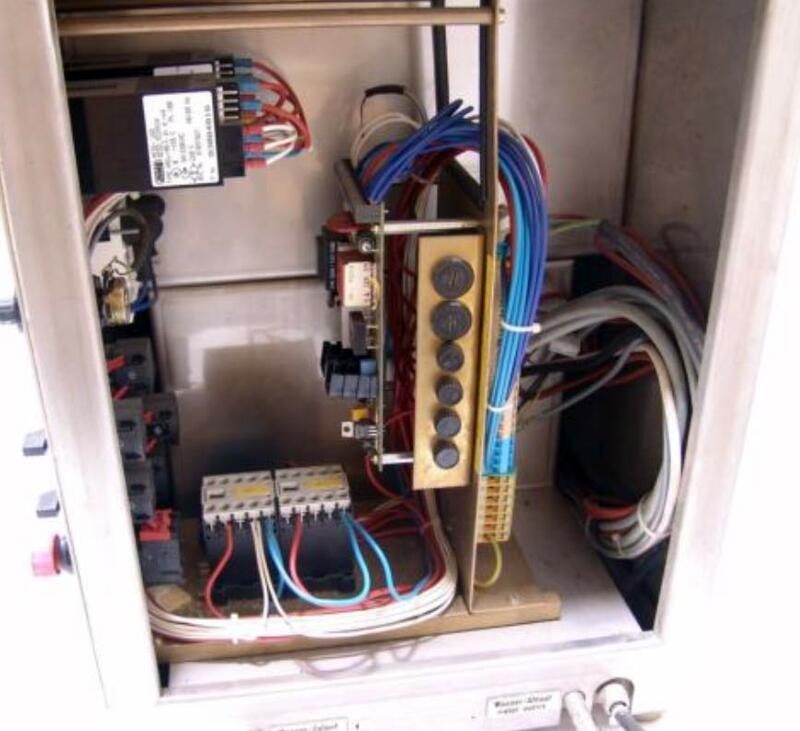 JACKETED HAS PROVISION FOR THERMOCOUPLE, INSULUATED WITH SHEATHING. 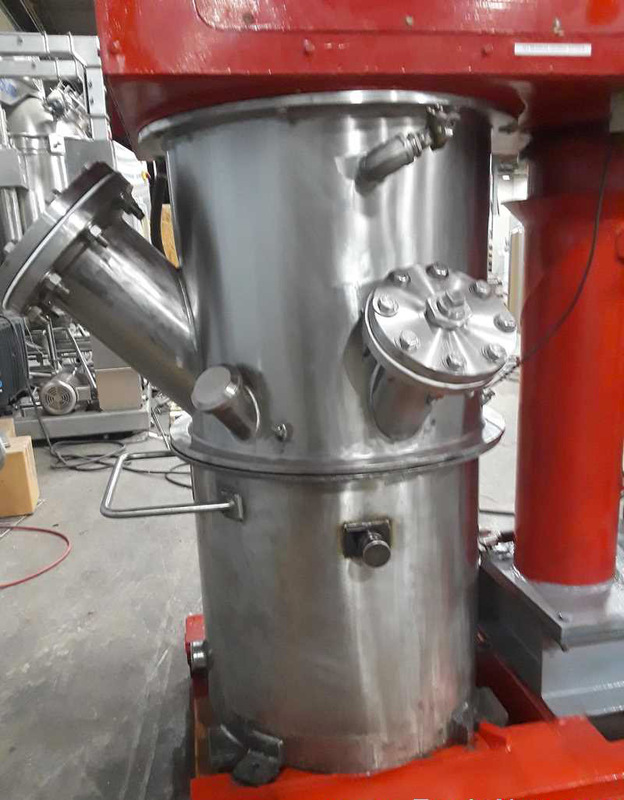 This can be a substitute for a double planetary mixer, this unit will handle many of the double planetary mixer applications and perform better in particular when top to bottom mixing is critical, this design can do it faster. Last used on an 800,000 cP product. 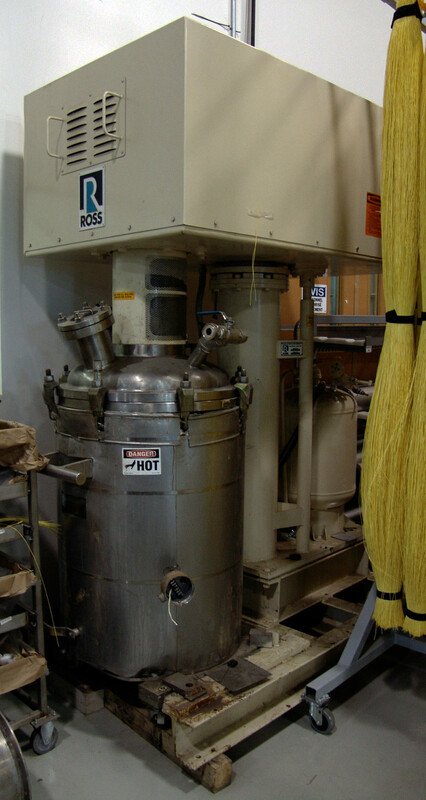 One only used Ross In-Line Ross High Shear Mixing System comprised of an in-line Ross Mixer Emulsifier, model HSM-425, driven by a 25 HP motor. 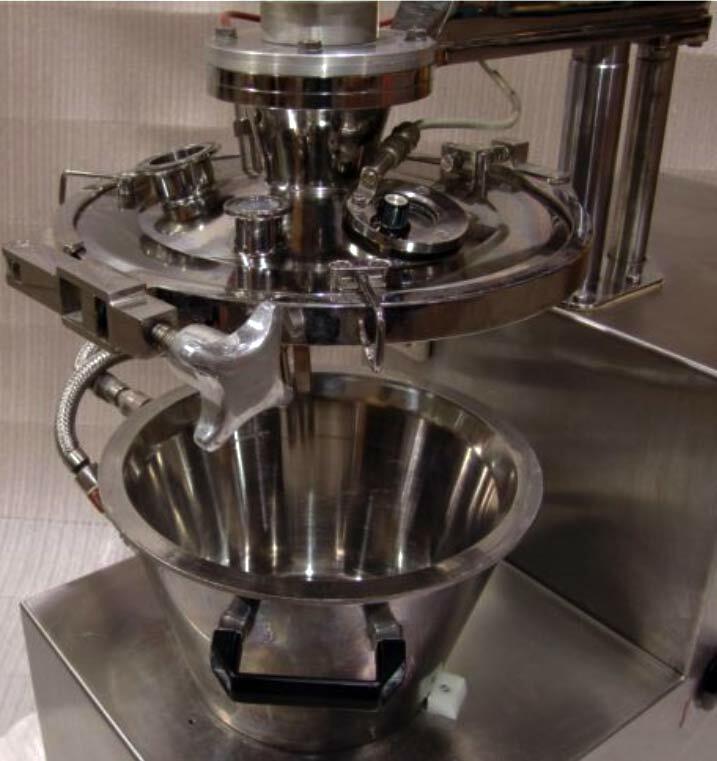 The system includes a stainless steel tank which is attached to the in-line high shear mixer. 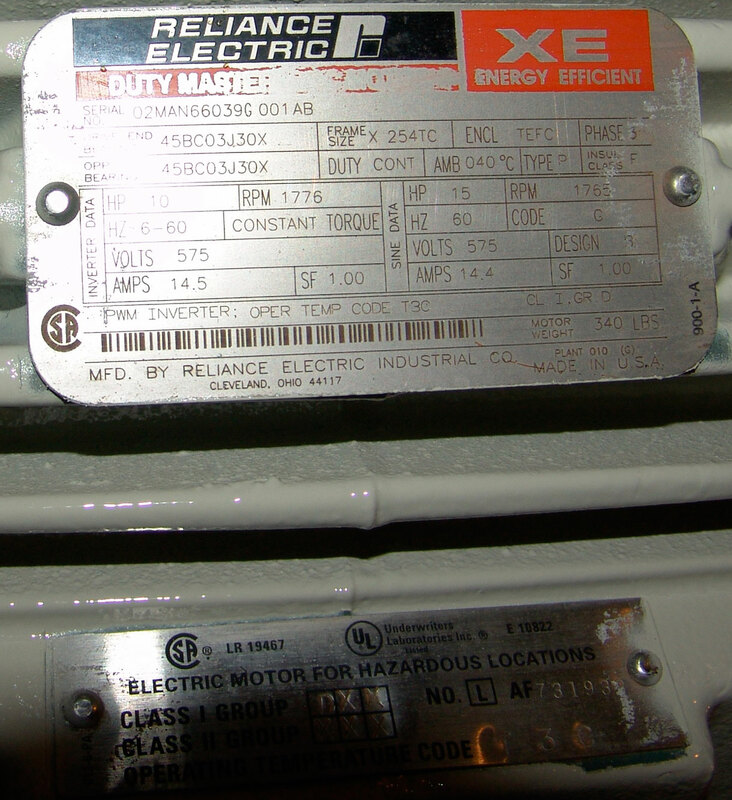 Rated for vacuum and pressure with. 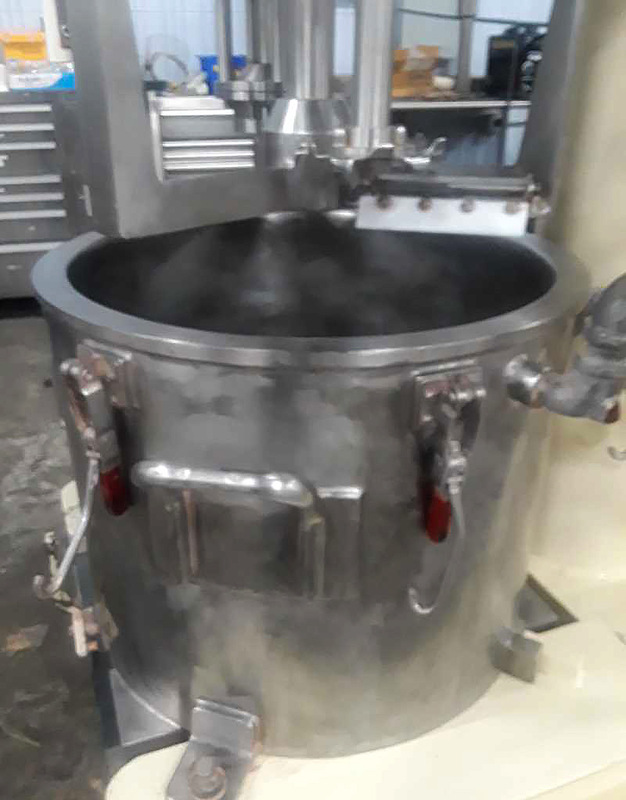 The powder is added to the liquid stream and circulated through the tank and high-shear mixer in a loop and part of the stream is diverted away from the loop and into the next step of your process. 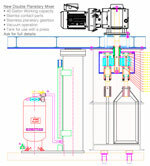 The unit can also be operated in a closed loop batch system. 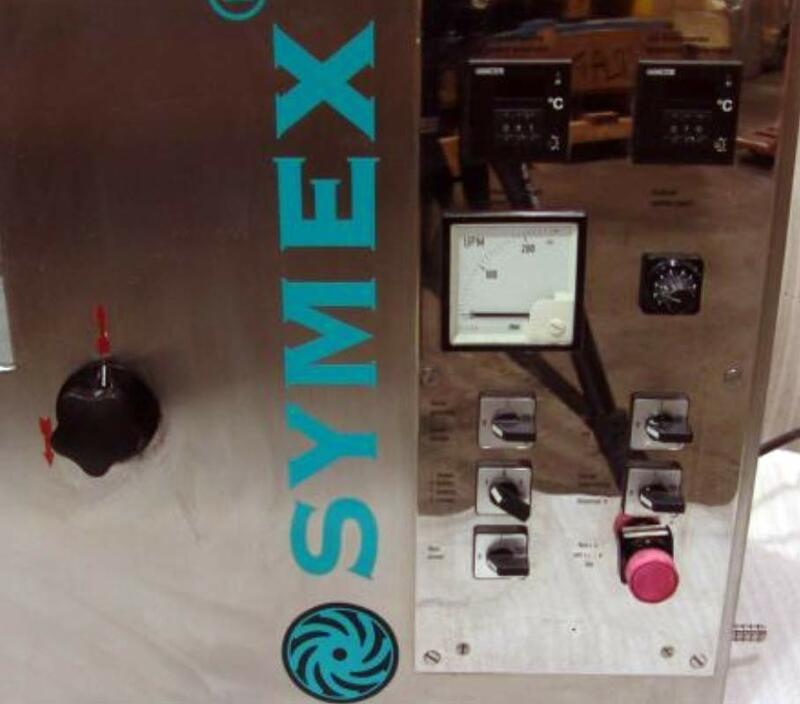 This 25 HP unit has a flow through rate of 350 USGPM based on water. 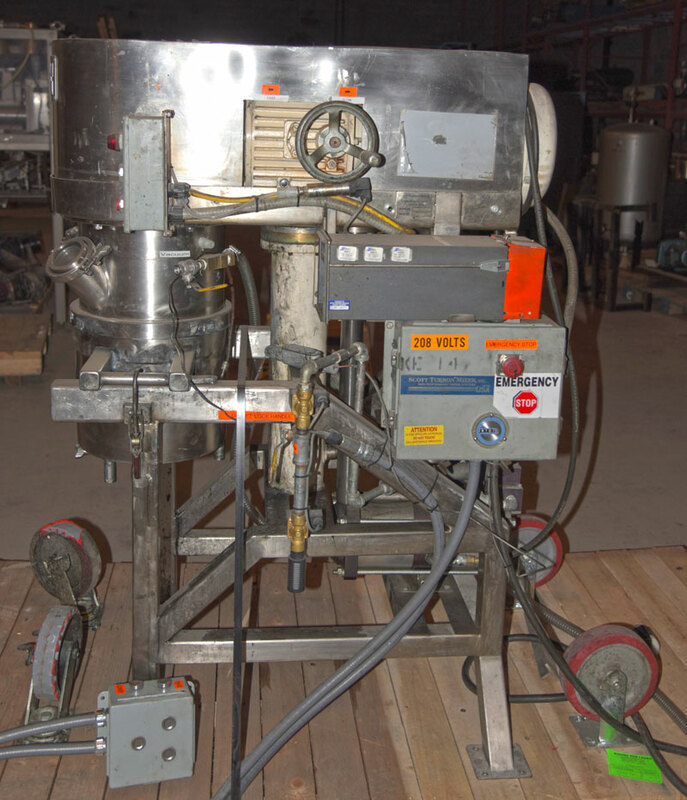 Will sell in-line mixer-emulsifier or the jacketed pressure vessel by itself. 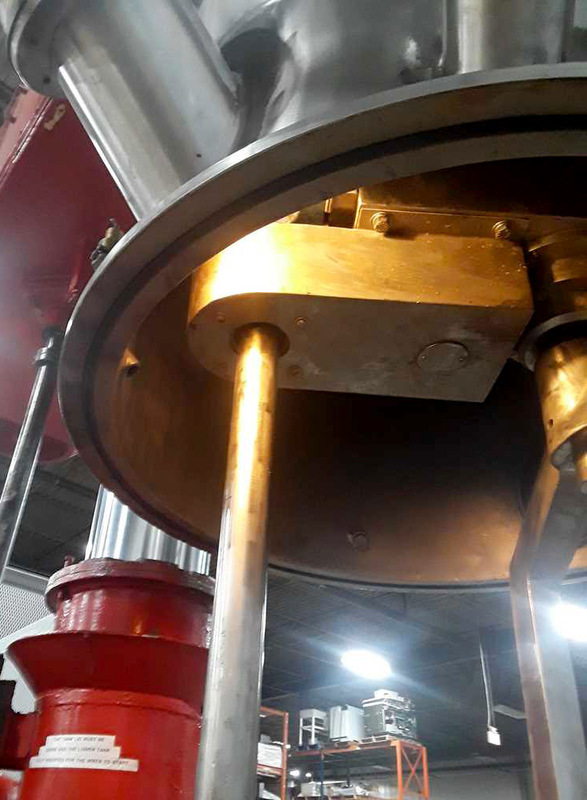 - Bottom Entering agitator. 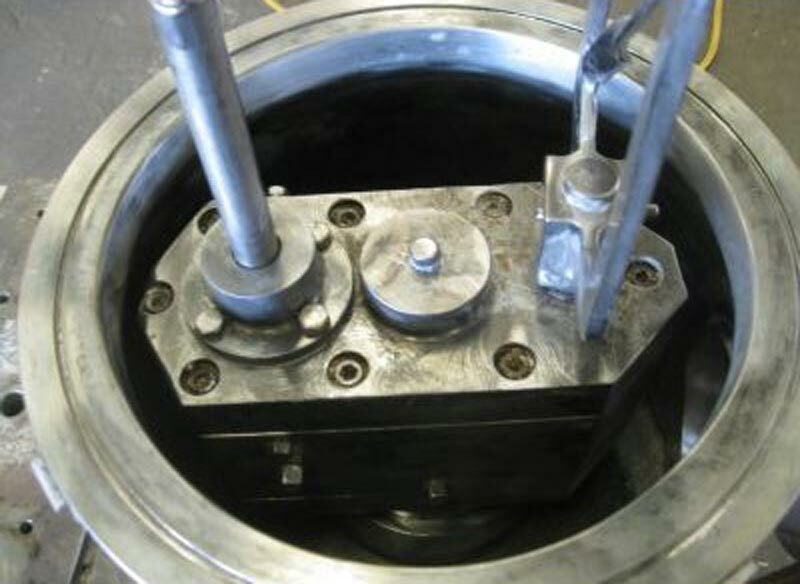 The shaft is enclosed inside a pipe with the agitator mounted at the top, thus eliminating the need for a submersed seal. 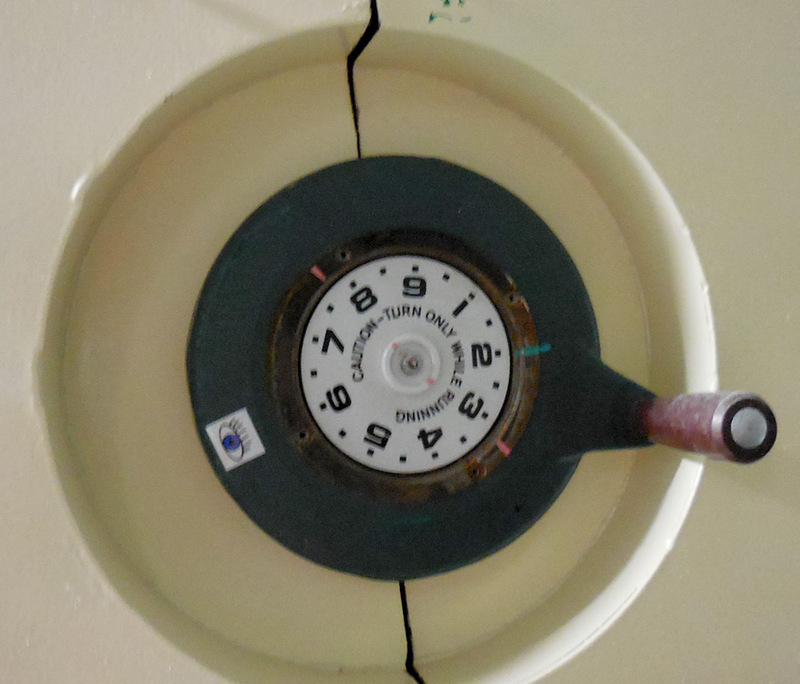 There is a seal at the top end of the shaft. 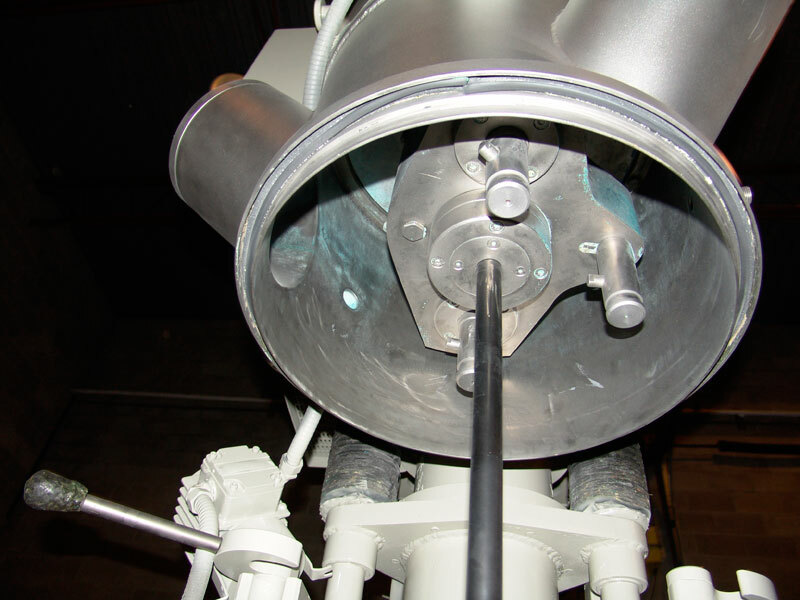 The agitator is an inverted anchor hanging from the top of the shaft. We rebuild. Click here to see typical examples of the work we do. 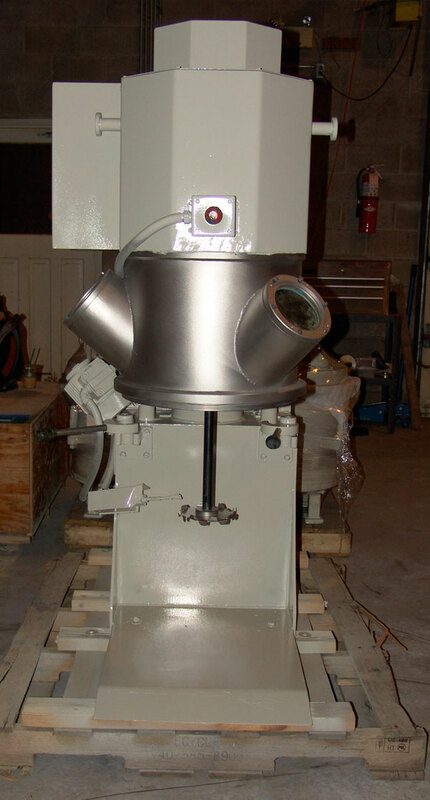 We are rebuiding three 225 gallon double planetary mixers. Two were sold and there is one left. 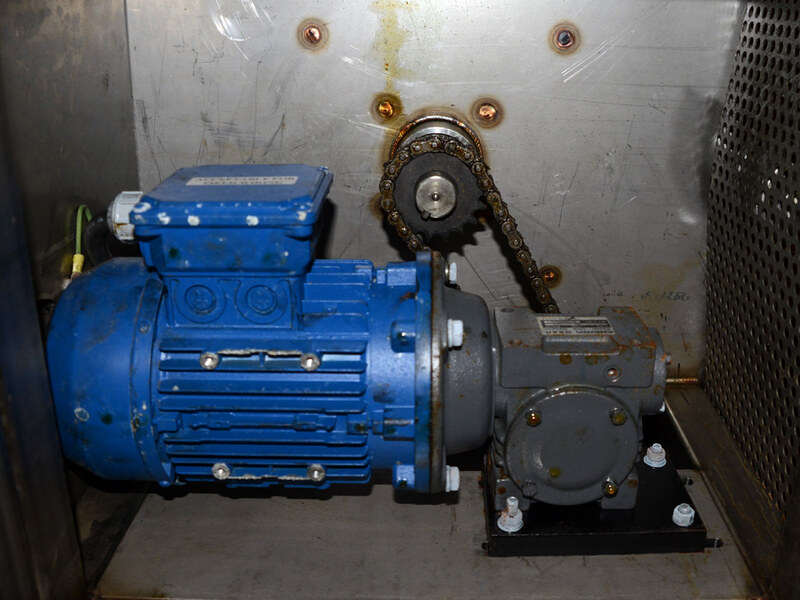 • The planetary gearbox will be disassembled and refurbished as required. 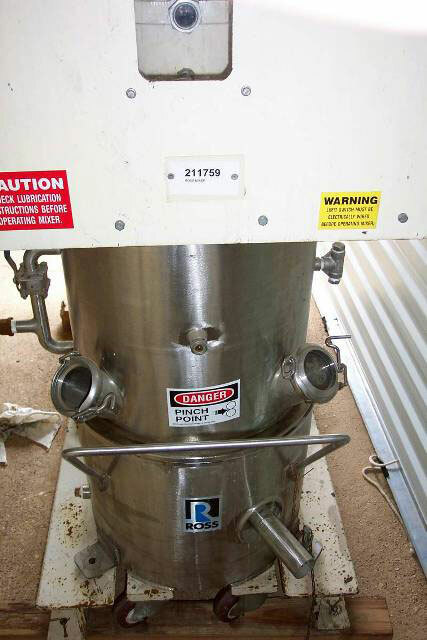 • 225 gallon mixing capacity, jacketed with a discharge valve a required. 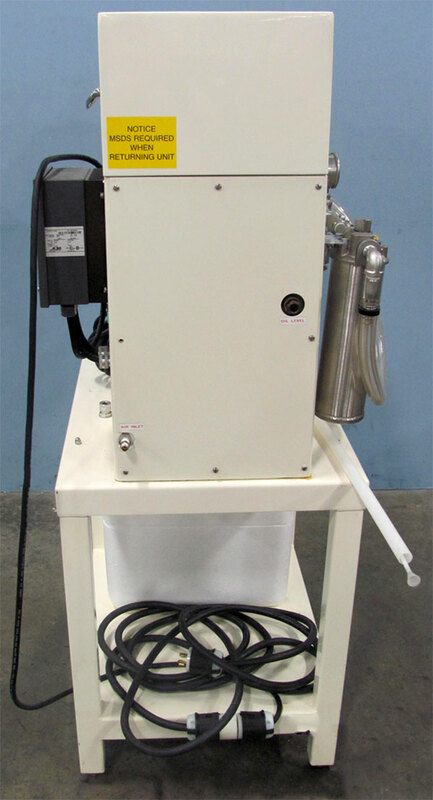 •Unitwill be reconfigured with a new hydraulic lift amd base. 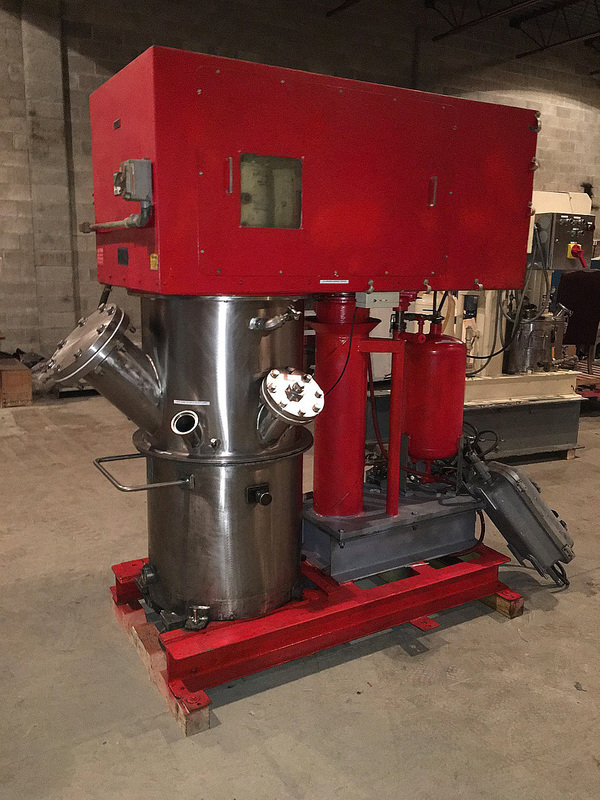 •If needed, we can also supply new tanks and a discharge press. 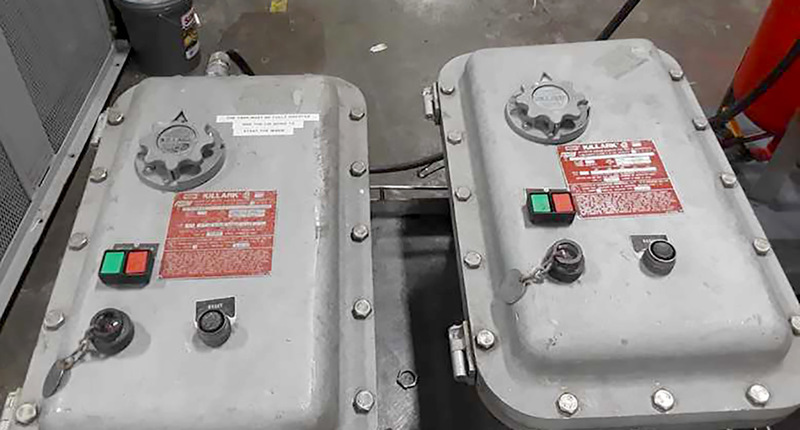 Two units are sold and one is scheduled for remanufacturing. 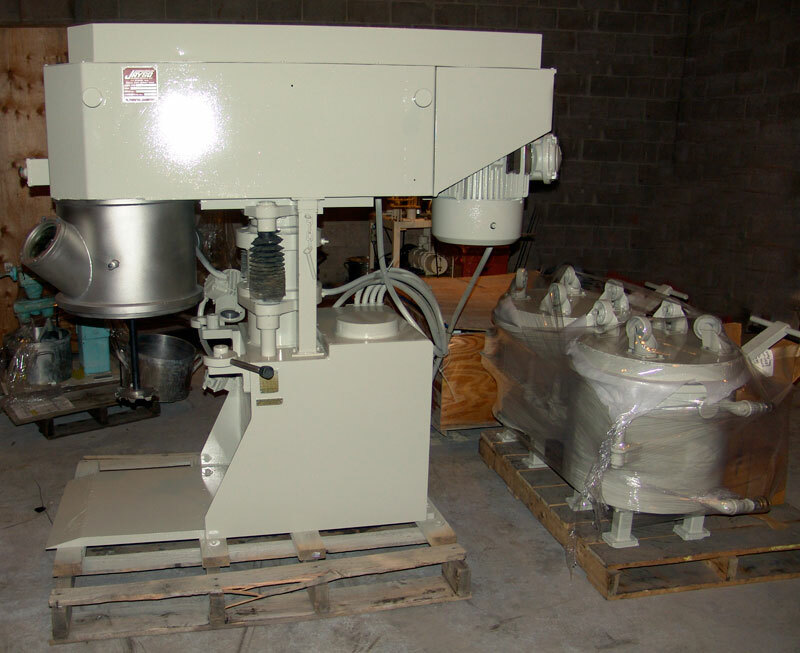 THIS MIXER HAS BEEN SOLD. I HAVE OTHER BUYERS, SELL ME YOURS. 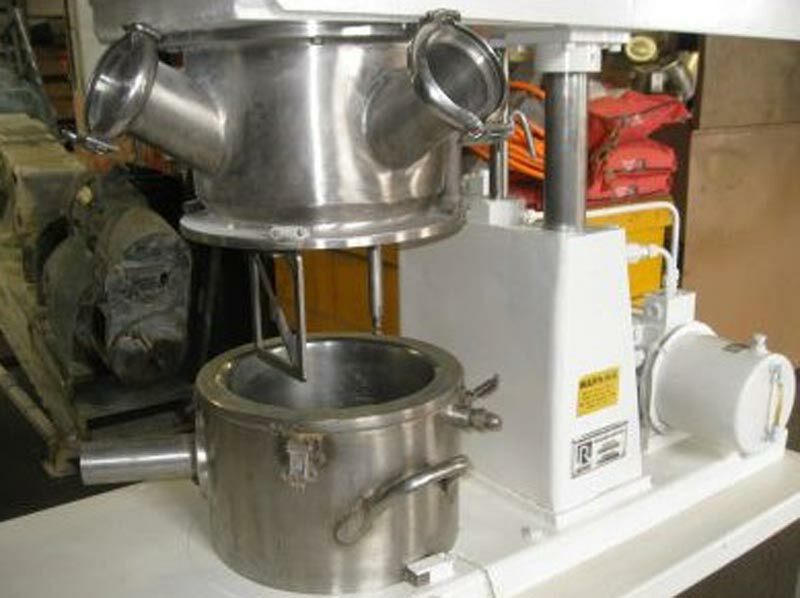 • The mixer is in very nice condition. 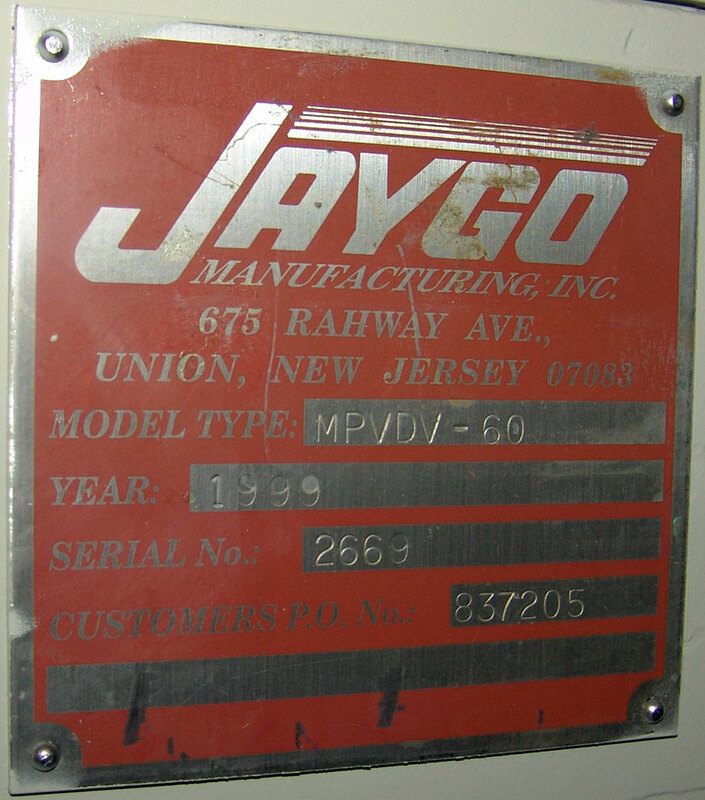 It was built in 1997 and had low usage, including a 5 year period without use at all. 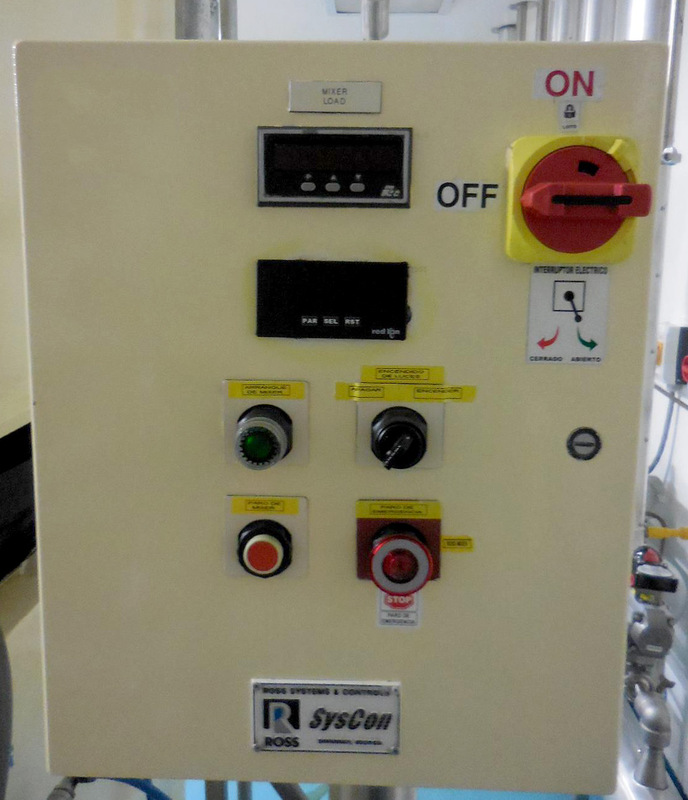 • Comes with control panel. 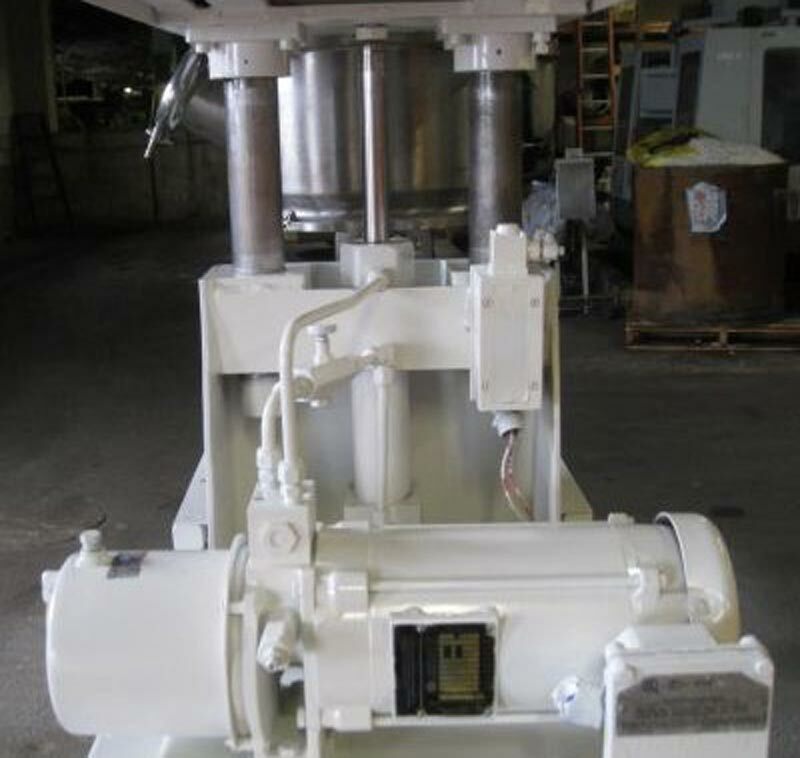 We want to buy your large dual shaft mixers. 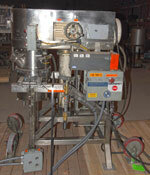 Visit our packaging equipment page for tube and sausage fillers.